Juliet Bernard is sharing her memories of the Belinda Boaden, the inspirational knitwear designer, who has sadly passed away..
Kate O’Sullivan explains “The Muse Connection”, bringing knitters together for friendship, fun and cake. For more information visit Kate and Helen on their blogs. 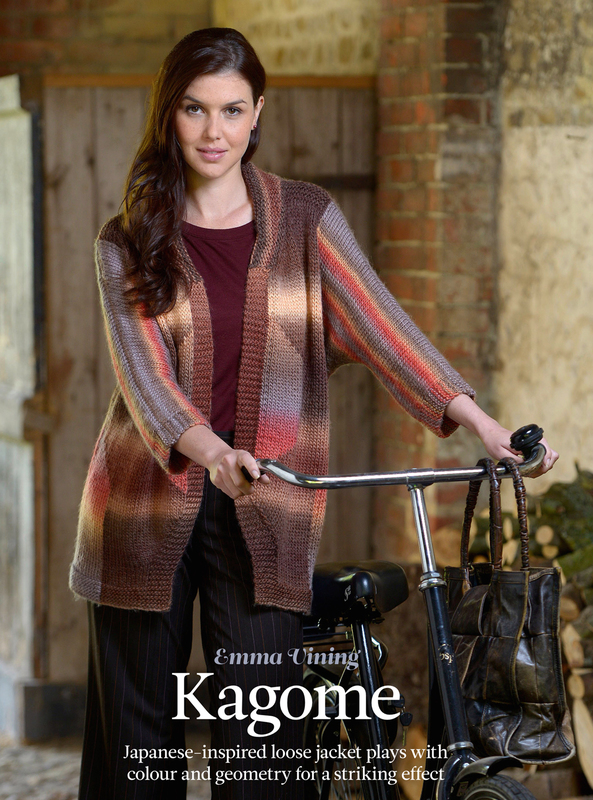 In “Looking East” Clare Devine has a closer look on the beauty and elegance of Japanese knitting patterns. 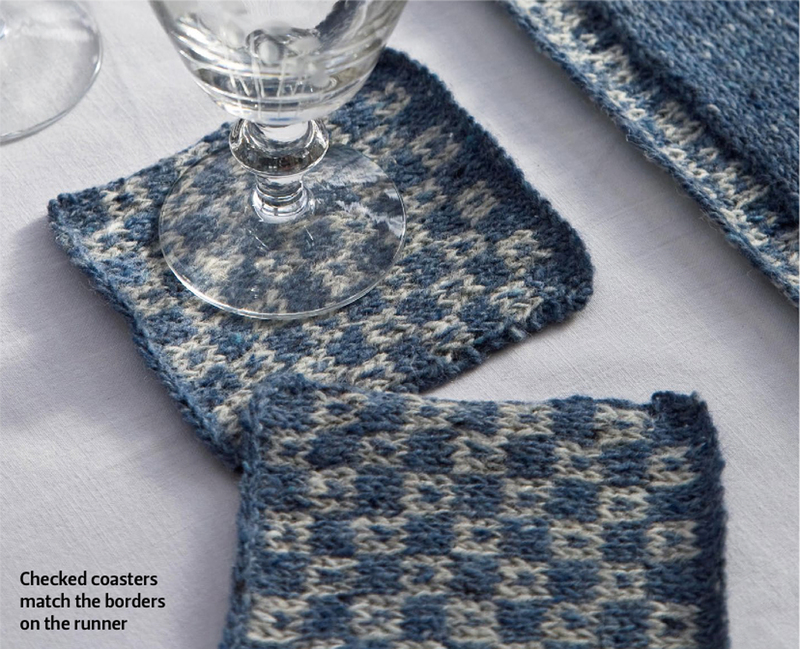 Faye Perriam-Reed explains how to knit from charts in the masterclass. And Susan Crawford is talking about her experiences on her farm in the guest column “High and lows”. 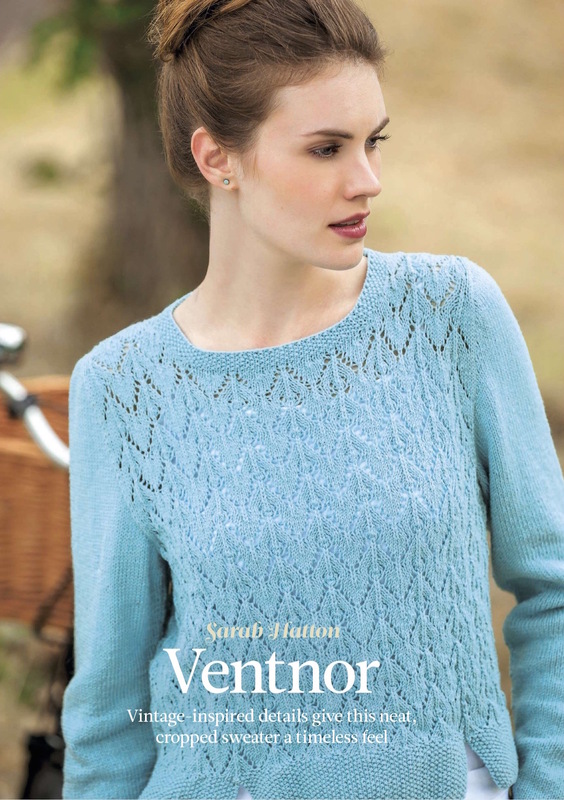 Also visit Susan on her website, where you also can find everything about her latest book “The Vintage Shetland Project”. One word before we have a look at the designs featured in this issue of The Knitter magazine: they are incredibly awesome! 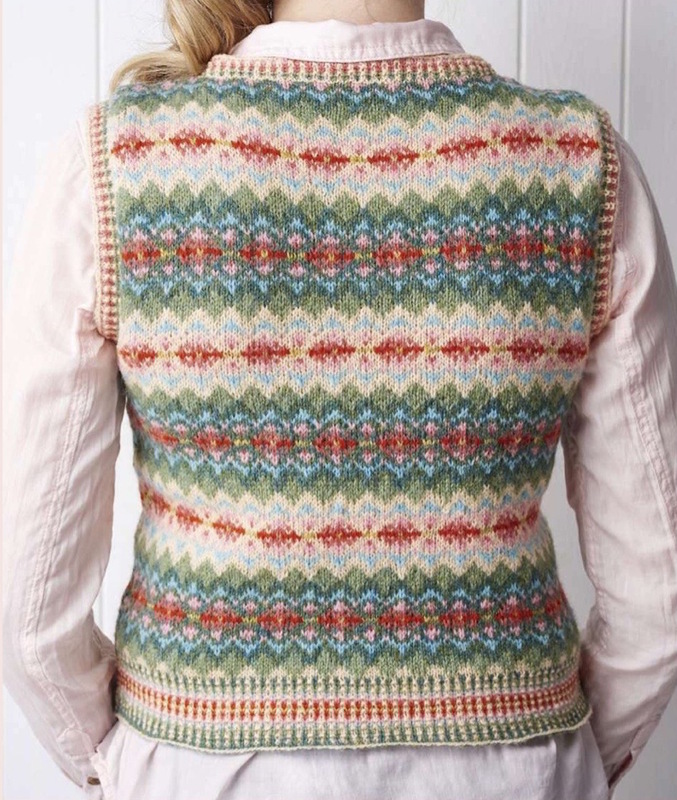 This tank top by Mary Henderson is knitted using traditional fair-isle technique. The garment is knitted in the round with steeks, which were later cut open and reinforced with crochet. The edgings are done in a multicolour corrugated rib pattern. This tank top is shown here in 8 shades Jamieson & Smith’s 2 ply Jumper Weight (4ply weight; 100% wool). Knitable in 7 sizes to fit bust from 86cm (34″) to 117cm (46″). Actual bust: 89cm (35″) to 116cm (45½”). 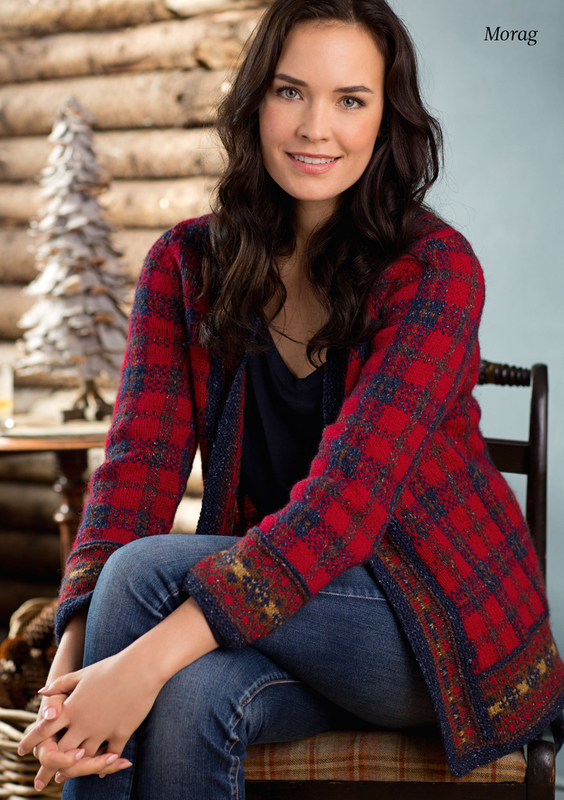 Every woman needs one: a cardigan. Especially if it is such a lovely one Pamela Wynne has designed this v-neck cardigan with afterthought pockets and contrasting colour details on button bands and endings. Shown here in Juniper Moon Farm’s Tenzing (Sport/Baby weight; 85% Merino wool, 15% yak). Knitable in 7 sizes to fit bust from 71-76cm (28-30″) to 132-137cm (52-54″). Actual bust: 76cm (30″) to 138cm (54½”). Judy Furlong has created this fantastic lace snood. It is knitted flat and the cast-on and cast-off edges are joined together. 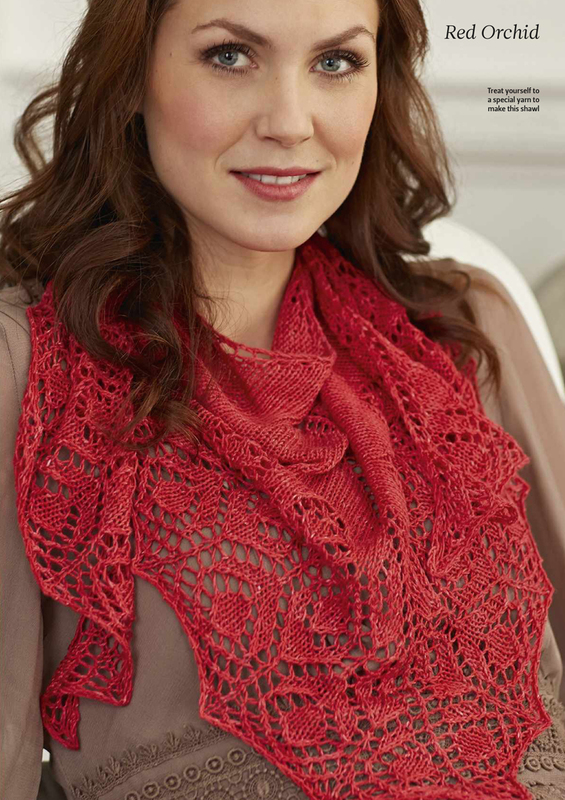 The lace edging pattern is knitted separately and then sewn on to the finished snood. Shown here in Hand Painted Alpaca Silk Lace (Lace weight; 70% superfine alpaca, 30% mulberry silk) from Artesano. Knitable in 6 sizes to fit bust from 82cm (32″) to 107cm (42″). Actual bust: 87cm (34″) to 112cm (44″). Knitable in 9 sizes to fit bust from 82cm (32½”) to 122cm (48″). Actual chest: 87cm (34¼”) to 129,5cm (51″). This vintage inspired jacket by Pat Menchini is designed to fit neatly. The ribbed pattern is offering some stretch. The peplum is worked using short-rows. Shown here in Baby Rooster (Baby/sport weight; 100% superwash merino wool) from Rooster. Knitable in 6 sizes to fit bust from 81cm (32″) to 107cm (42″). Actual bust: 86cm (34″) to 112cm (44″). Mary Henderson designed this lovely lace wrap in Jamieson’s of Shetland’s Shetland Spindrift (DK weight, 100% Shetland wool). Starting with a provisional cast-on this wrap is knitted flat. The second lace border is knitted from the provisional cast-on to finish this wrap. This classic round-neck cardigan is showing an all-over lace pattern. All pieces including the neckbands are knitted separately and sewn together. 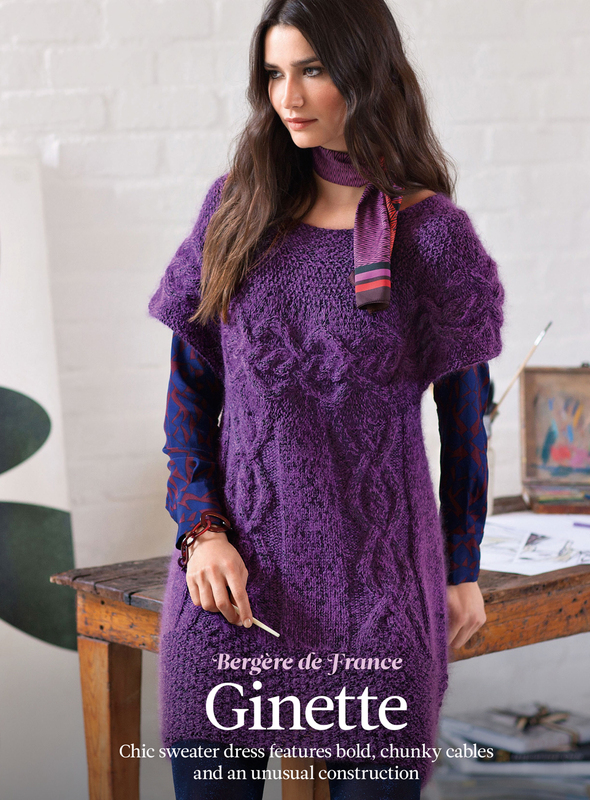 Shown here in Bergère de France’s Ecoton (DK weight; 48% cotton, 48% acrylic, 4% other fibres). Knitable in 6 sizes to fit bust from 77cm (30¼”) to 126cm (49½”). Actual bust: 85cm (34″) to 134cm (52¾”). Sarah Hatton created this cropped sweater with a vintage touch. 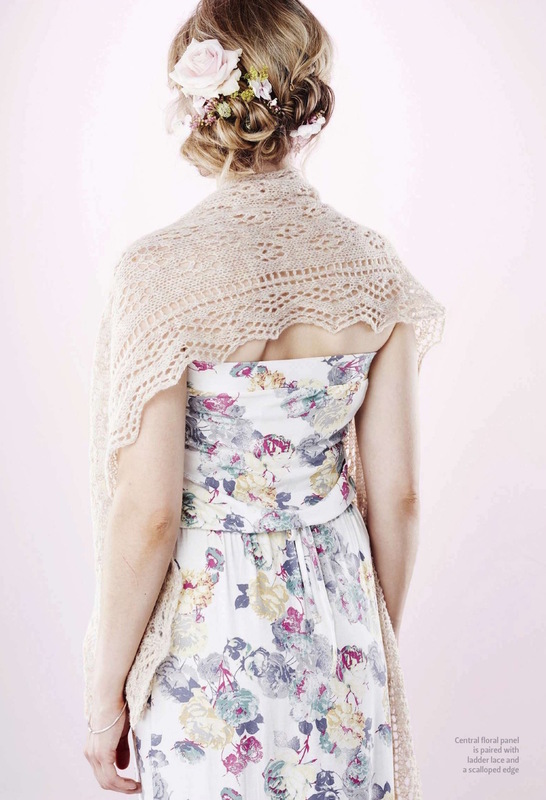 An all-over lace pattern is shown on both front and back, whereas the sleeves are knitted in plain stockinette-stitch. The edgings are knitted in moss-stitch. Shown here in Rowan Wool Cotton 4Ply (4ply weight; 50% cotton, 50% Merino wool). Knitable in 8 sizes to fit bust from 81cm (32″) to 117cm (46″). Actual bust: 86cm (34″) to 124cm (49″). These pair of knee-high socks are showing a lovely pattern, which is created knitting tiny bobbles. They are shown here in Kroy Socks (4ply weight; 75% wool, 25% nylon) from Patons North America. Knitable in 3 sizes to fit foot circumference from 20cm (8″) to 25cm (9¾”). Actual foot circumference: 17¾cm (7″) to 23cm (9″). Actual bust: 90cm (35½”) to 128cm (50½”). 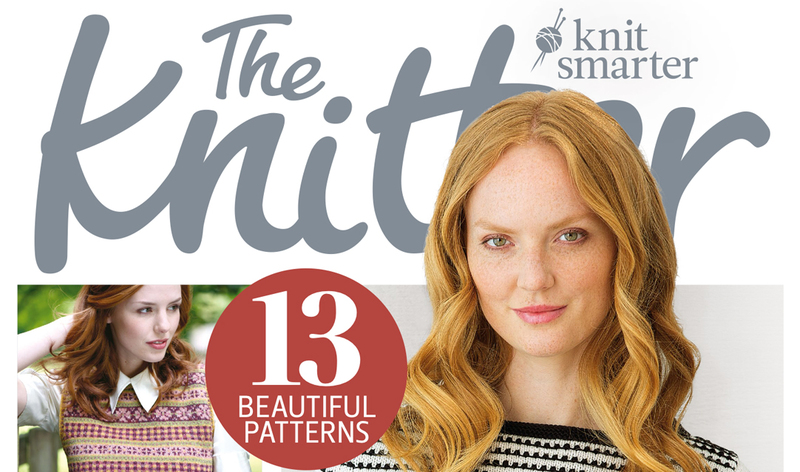 The next issue of The Knitter will be on sale September 14. It will feature exclusive designs from Eline Oftedal, Sasha Kagan, Deborah Helmke, Martin Storey, Ashley Knowlton … and more. And you will explore the designs of Elsebeth Lavold and discover the intriguing techniques of Sequence Knitting, plus a free Anniken Allis booklet. All pictures shown above are screenshots from my digital magazine. A while ago The Knitter Magazine 80 arrived on my iPad. This issue comes with 15 patterns. Winter Warmers: Clever ways with stitches and shape for the new year. 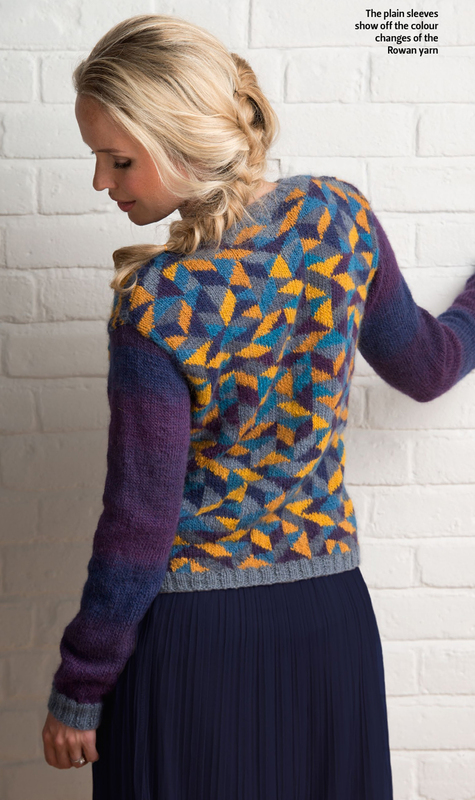 Be inspired by Felicity Ford from Knitsonik. She is telling all about her exciting project. Nancy Johnston is talking about her passion for the Mongolian culture in Yaks, yarn & knitwear. Penny Batchelor is reporting what it takes to bring a new yarn brand to the knitting market. Fresh up your skills doing the Kitchener Stich with Jen Storey in the masterclass. 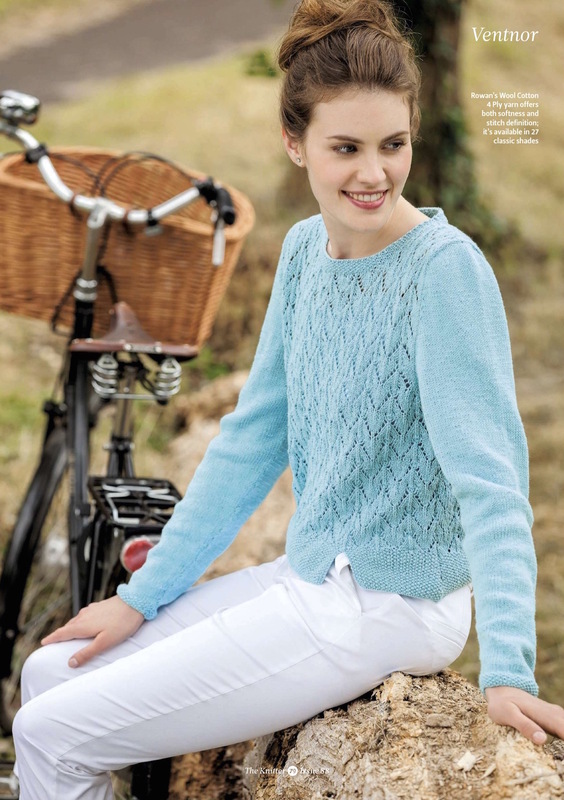 Lets now have a look at the designs featured in this issue of The Knitter magazine. 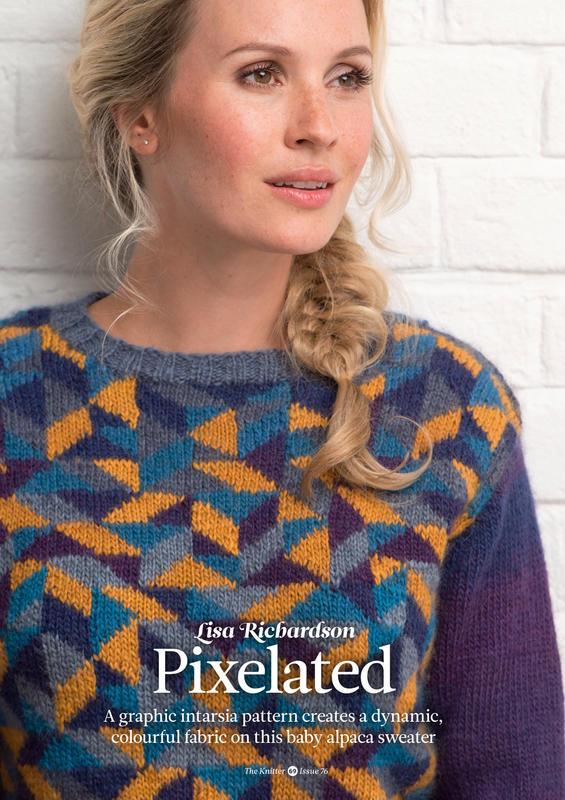 This wide-neck raglan jumper by Lisa Richardson is showing an interesting pattern, which is formed winding yarn around stitches. Afterward you embroider zigzag lines onto front and back using two strands of yarn. This design is also featuring a modern high-low hem. Shown here in Rowan Kid Classic (Aran weight; 70% lambswool, 22% kid mohair, 8% polyamide). Knitable in 10 sizes to fit bust from 81cm (32″) to 127cm (50″). Actual bust: 104cm (41″) to 152cm (60″). 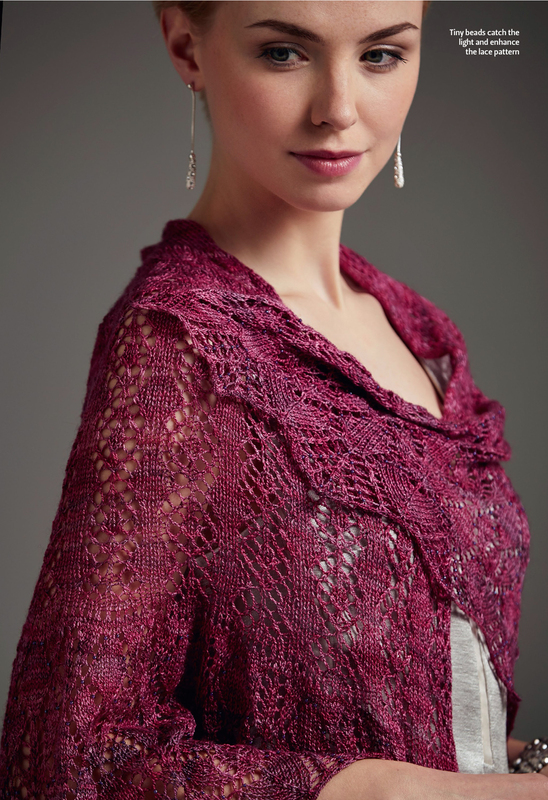 This lovely triangle lace shawl by Anniken Allis is showing a pattern which is a reminiscent of exotic orchids. Shown here in Skein Queen Luminosity (4ply weight; 100% mulberry silk). Depth at centre back: 50cm (19½”). This traditional fisherman’s pattern is transformed into a new shape by Judy Furlong. 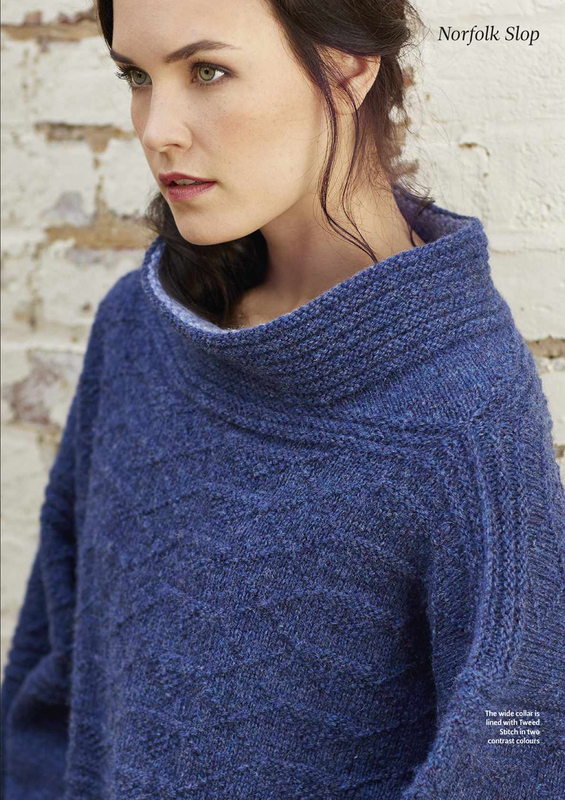 A wide neck, contrasting colours used in pockets and neckline are former highlights. 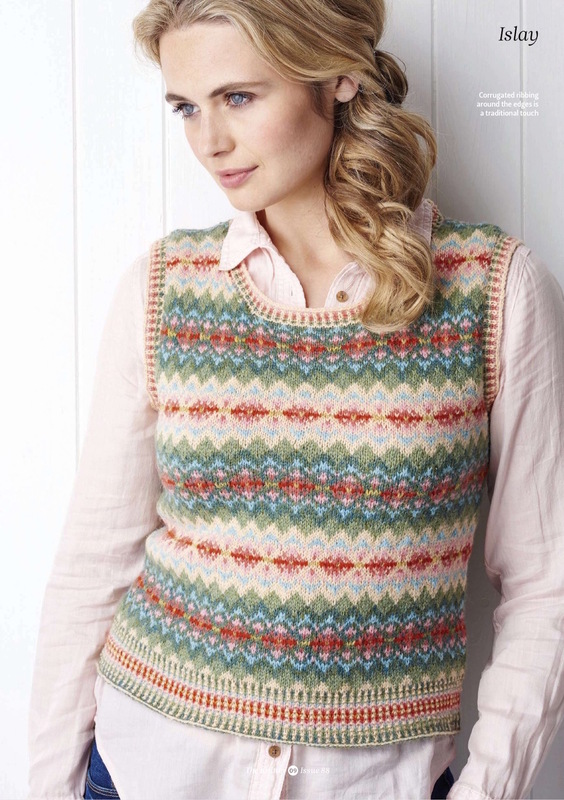 It is knitted in the round with a Guernsey pattern on the yoke and sleeves and with gussets at the underarms. Shown here in New Lanark Heather Blends DK (DK weight; 100% wool). Knitable in 9 sizes to fit bust from 86cm (34″) to 127cm (50″). Actual bust: 101cm (39¾”) to 143cm (56¼”). 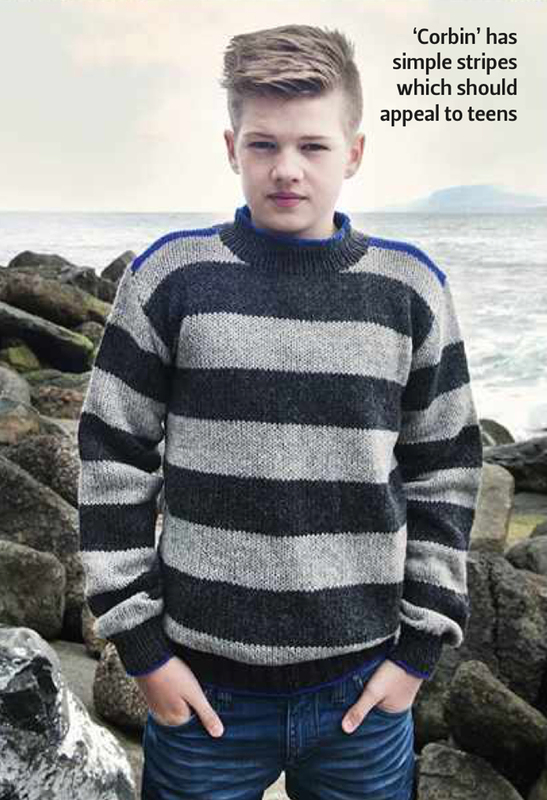 The front of this short-sleeved jumper is knitted in 3 sections using different yarns. Two panels showing a cable pattern and a center lace pattern. The sections are joined after finishing the front. The back is showing a cable pattern and is knitted in one piece, as the sleeves. Shown here in 3 yarns from Bergère de France: Caline (4ply weight; 60% acrylic, 20% polyamide, 20% combed wool), Lumiac (100% polyester) and Sirène (Laceweight; 100% polyamide). Knitable in 5 sizes to fit bust from 76cm (30″) to 112cm (44″). Actual bust: 80cm (37½”) to 116cm (45½”). This shawl-collard cardigan by Sarah Hatton for both girls and boys has a zigzag textured yoke. It is shown here in Rowan Pure Wool Worsted (100% superwash wool). Knitable in 7 sizes to fit chest from 44cm (17¼”) to 61cm (24″). Actual chest: 56cm (22″) to 68cm (26¾”). This oversized and comfy roll-neck sweater by Galina Carroll was first published in Rowan Knitting & Crochet Magazine 56. It is knitted in fair-isle technique and is showing a lovely pattern. The sleeves are knitted in a rib pattern. Shown here in 4 shades Rowan Felted Tweed (DK weight; 50% Merino wool, 25% alpaca, 25% viscose). Knitable in 5 sizes to fit bust from 81-86cm (32-34″) to 122-127cm (48-50″). Actual bust: 164cm (65″) to 212cm (83″). 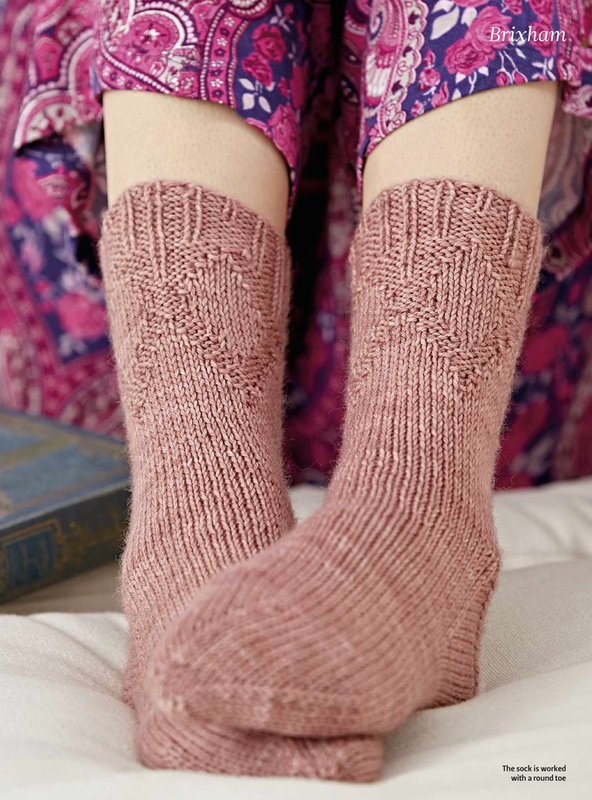 These socks by Katya Frankel are knitted using a DK-weight yarn and are showing a diamond pattern at the cuff. Shown here in Eden Cottage Yarn Oakworth DK (DK weight; 100% superwash Polwarth wool). Knitable in 2 sizes to fit foot circumference 22cm 8½) and 26cm (10¼”). A colourful graphic design, knitted using intarsia technique is shown on this design by Sasha Kagan. Cubes and crosses in different colours are placed all over the front and back of this sweater. The sleeves are worked in one colour. Shown here in 6 shades of Rowan Wool Cotton (DK weight; 50% wool, 50% cotton) and 1 shade of Rowan Tweed (DK weight; 100% wool) as main colour on front and back..
Actual bust: 91cm (36″) to 133cm (52½”). 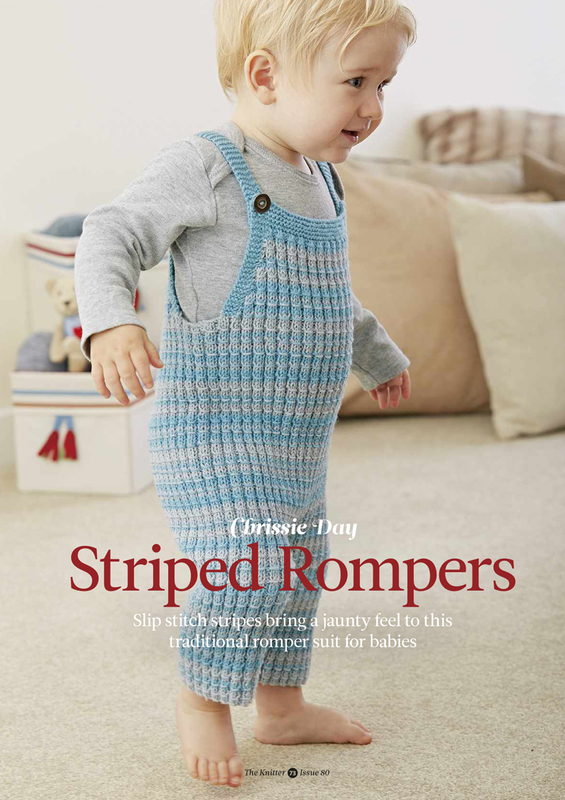 These striped rompers for the little ones is knitted in the round and is showing a rib and slip-stitch pattern. Chrissie Day has published this pattern in her book Knitted Modern Classics for Babies, published by Quail Publishing. Shown here in Rowan Wool Cotton 4ply (4ply weight; 50% cotton, 50% wool). Knitable in 5 sizes to fit age 0-3mths to 12-18mths. Actual chest 51cm (20″) to 59cm (23¼”). 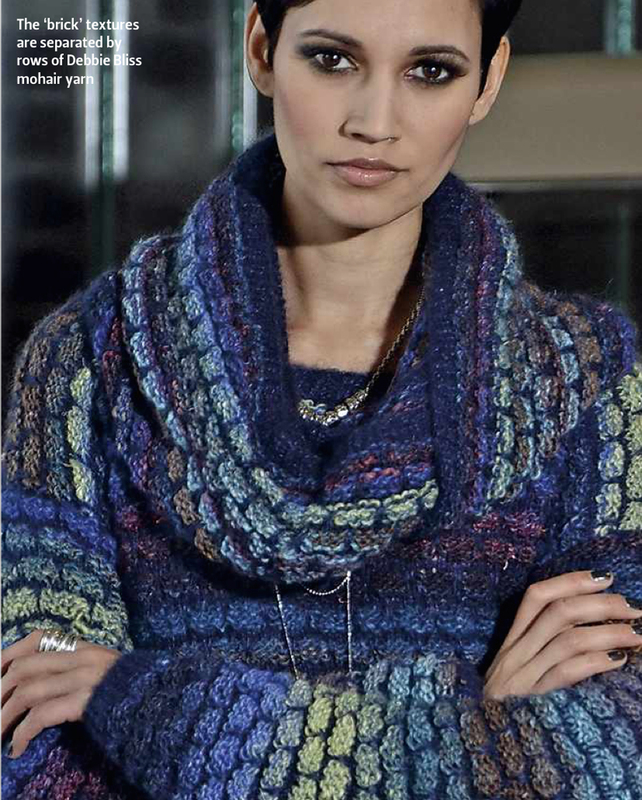 The oversized sweater Avril by Claudia Wersing is shown here in Noro Silk Garden (Aran weight; 45% silk, 45% mohair, 10% wool) and Debbie Bliss Angel (Laceweight; 76% mohair, 24% silk). Using two strands of solid Angel knitting 4 rows below the brick-like effect of this garment is created. Knitable in 3 sizes to fit bust from 81-86cm (32-34″) to 102-107cm (40-42″). Actual bust: 104cm (41″) to 124cm (48¾”). The matching cowl Amber is worked flat in the same stitch as Avril. 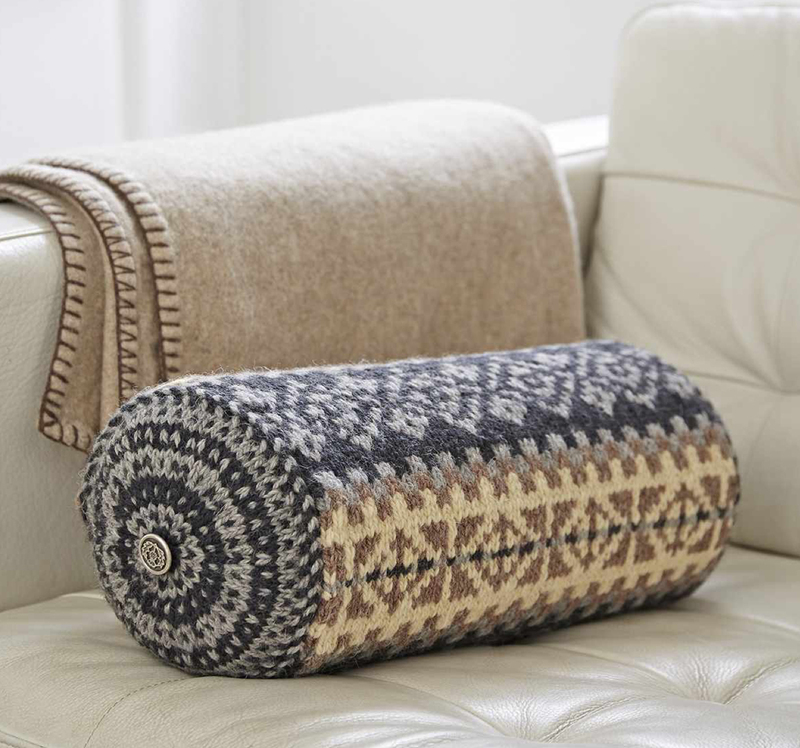 To fit a bolster 40cm (15¾) long and 18cm (7″) in diameter. 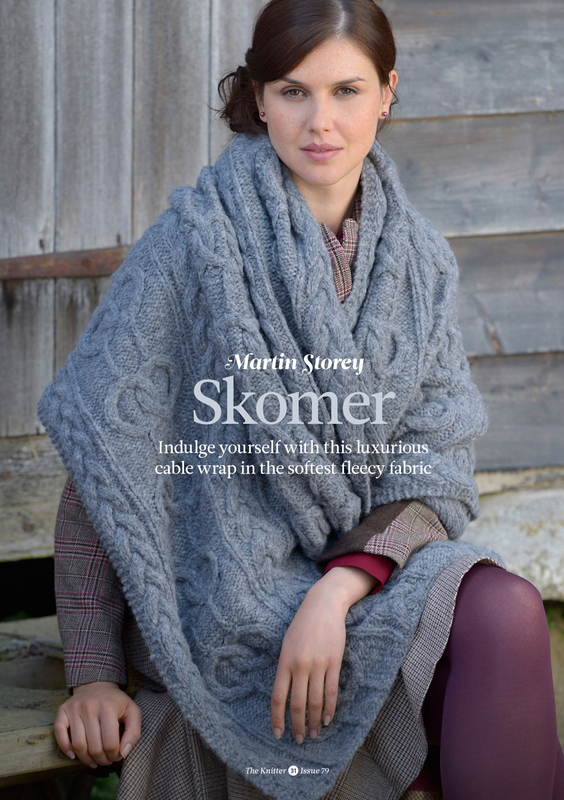 This design by Martin Storey is taken from the Rowan’s Brushed Fleece Collection. It is knitted in stockinette stitch and is featuring mock pockets on the front. Shown here in 3 muted shades of Rowan Brushed Fleece (Chunky weight; 65% wool, 30% alpaca, 5% polyamide) a feather-light cosy yarn. Actual bust: 92cm (36″) to 142cm (56″). This design by Malan Steinhólm is showing a three-colour slip-stitch pattern and is worked in the round until the armhole. Then both sleeves are knitted in the round. After joining sleeves and body the raglan yoke is again knitted in the round. Shown here in Navia Duo (4ply weight; 100% wool). Knitable in 3 sizes to fit chest from 53cm (20¾”) to 63cm (25″). Actual chest: 60cm (23½”) to 72cm (28¼”). This design by Eyðgerð Í Garði is showing a tulip fair-isle motif on the yoke. The body is knitted in one piece until the armhole. The two sleeves are knitted in the round and joined to the body. Now the yoke is knitted in one piece. Shown here in Navia Duo (4ply weight; 100% wool). Knitable in 3 sizes to fit chest from 54cm (21¾”) to 63cm (25″). Actual chest: 68cm (26¾”) to 76cm (30″). 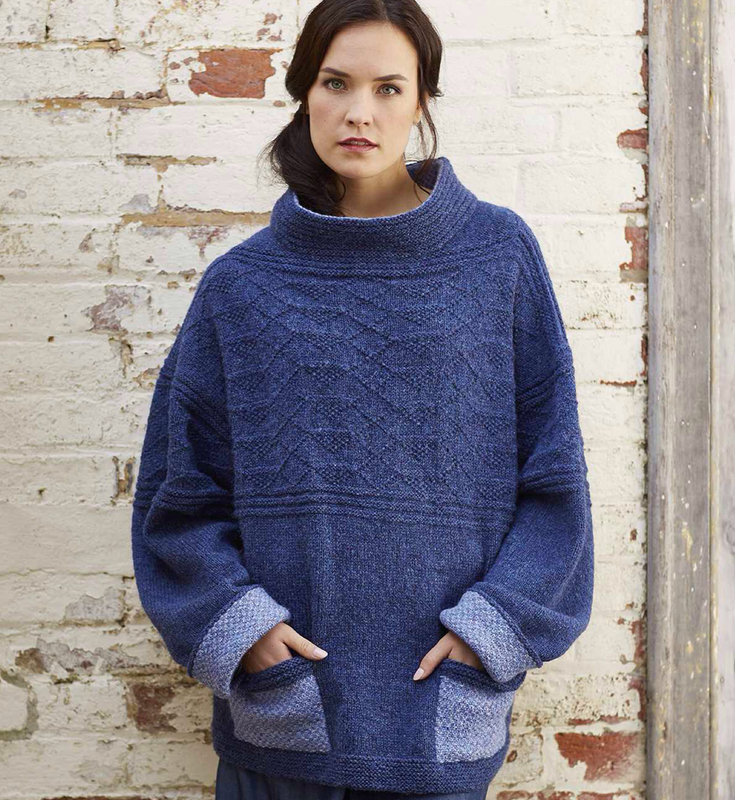 This design by Anja Samuelson is also knitted in the round until the armholes, then finished working back and forth. The sleeves are knitted in the round until the shaping of the sleeve head is starting. Shown here in Navia Duo (4ply weight; 100% wool). Knitable in 5 sizes to fit chest from 71cm (28″) to 83cm (32½”). Actual chest: 90cm (35½”) to 108cm (42½”). The next issue of The Knitter will be on sale January 6. It will feature exclusive designs from Anniken Allis, Sasha Kagan, Mary Henderson, Sarah Hatton, Katya Frankel … and more. And you will get a free children’s classic collection. A while ago The Knitter Magazine 79 arrived on my iPad. This issue comes with 14 patterns. Modern classics with colourwork and cables for your winter wardrobe. 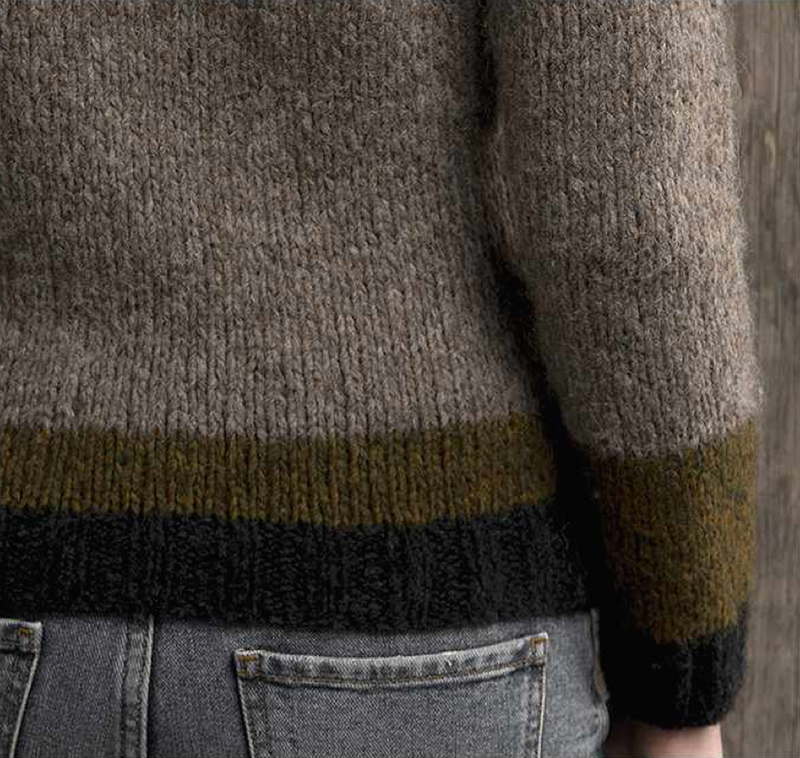 Meet Gudrun Johnston, the passionate designer, who brings back Shetland knitting traditions to modern audience. Designer Susan Crawford talks about her new life as a sheep farmer in the guest column. Meet Wool & The Gang on their mission to get young people excited about knitting. Learn how wraps short rows are used for creating a neat shaping in the Masterclass. 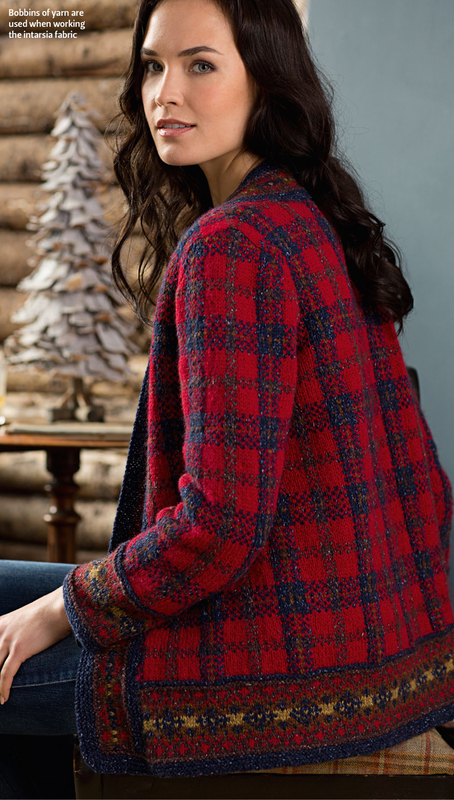 This cardigan is showing both tartan and fair-isle patterns. The tartan pattern is worked in a combination of intarsia and stranded knitting, whereas the fair-isle pattern – well what a shock – is using fair-isle technique. Judy Furlong has designed this stunning piece using New Lanark Donegal Silk Tweed DK (DK weight, 90% wool, 10% silk) and New Lanark Heather Blends DK (DK weight, 100 % wool). Knitable in 4 sizes to fit bust from 71-86cm (28-34′) to 133-147cm (52-54′). Cables on front and back meets stockinette stitch (and a single twist) on sleeves. Fielding by Emma Vining is shown here in Fyberspates Scrumptious Aran (Aran-weight, 55% merino, 45% silk) in shade Rose Pink 408. Knitable in 5 sizes to fit bust from 81-87cm (32-34′) to 122-127cm (48-50′). This stunning wrap by Martin Storey is knitted using the new Rowan Brushed Fleece (Chunky weight, 65% wool, 30% alpaca, 5% polyamide). This pattern is originally published in Rowan Brushed Fleece, a brochure featuring 16 feather light designs for women and men by Martin Storey. Skomer is showing two different cables. Size: 85,5cm width (34′) x 200cm (79′) length. 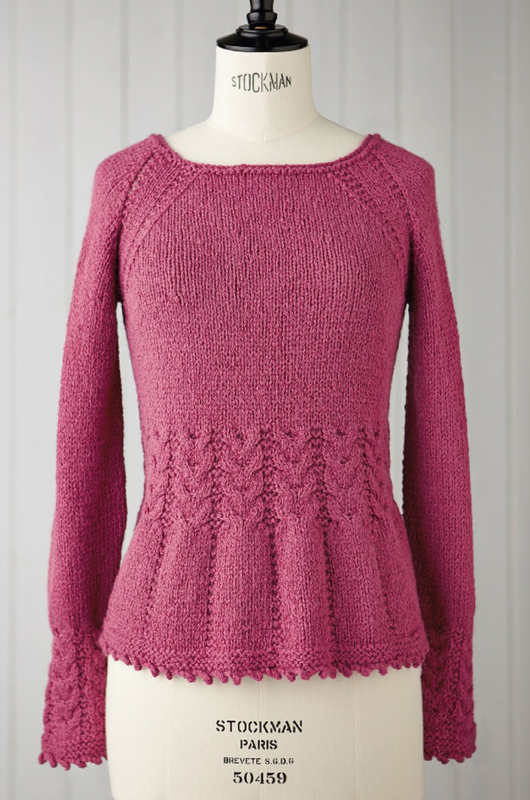 This sweater by Katya Frankel is knitted in the round, using short rows to add length to the back. The yoke is also knitted back and forth to raise the back neck of this design. Shown here in Malabrigo Worsted (Aran weight; 100% merino wool). Knitable in 7 sizes to fit bust from 77,5cm (33½’) to 128,5cm (50½’). This dress is knitted top-down. First the yoke is knitted using short-row shaping, then stitches for front and back are picked up from the yoke and knitted. Ginette is knitted holding one strand of Bergère de France Sirène (Laceweigth, 100% polyamide) and Bergère de France Pure Douceur (Aran weight, 58% superkid mohair, 37% polyamide, 5% wool) together throughout. Knitable in 4 sizes to fit bust from 91cm (36′) to 122cm (48′). To fit head circumference 53 – 62cm (21 – 24½’). Lisa Richardson designed this adaptation of a classic denim shirt exclusive for The Knitter magazine. 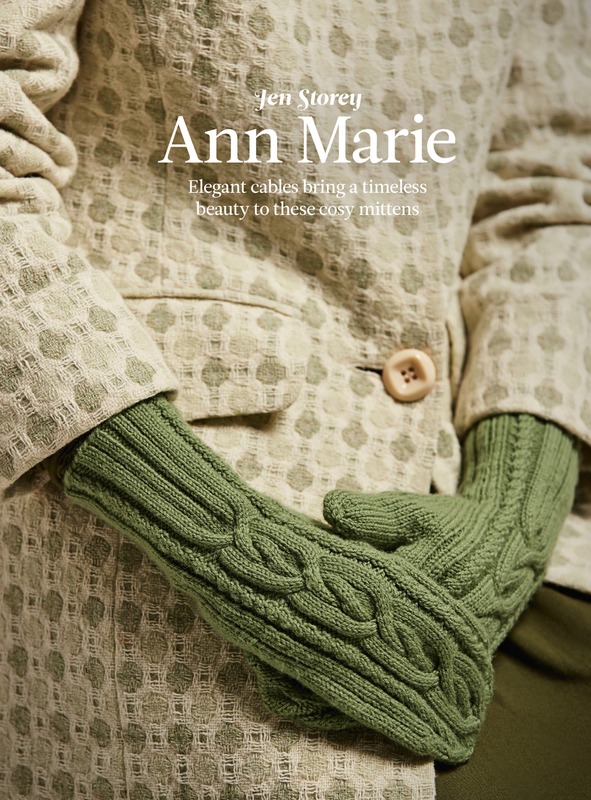 It is showing an all-over lace pattern and plain knitted hems, cuffs and buttonbands in a contrasting colour of Rowan Cotton Glacé. The colour Blue is the key trend for this summer. So start to knit this stunning design. Knitable in 10 sizes to fit bust from 81cm (32′) to 127cm (50′). This lovely scarf showing a snowflake fair-isle pattern is knitted in the round. Juliet Bernard has used Kauni Effektgarn (Baby/Sport weight, 100% wool). These socks created by Clare Devine are showing a twisted rib and lace rib pattern and are knitted from cuff to toe, but the pattern placement differs. Shown here in Fyberspates Vivacious 4ply (4ply weight, 100% superwash merino). To fit foot circumference 21 – 26cm (8¼ – 10¼’). 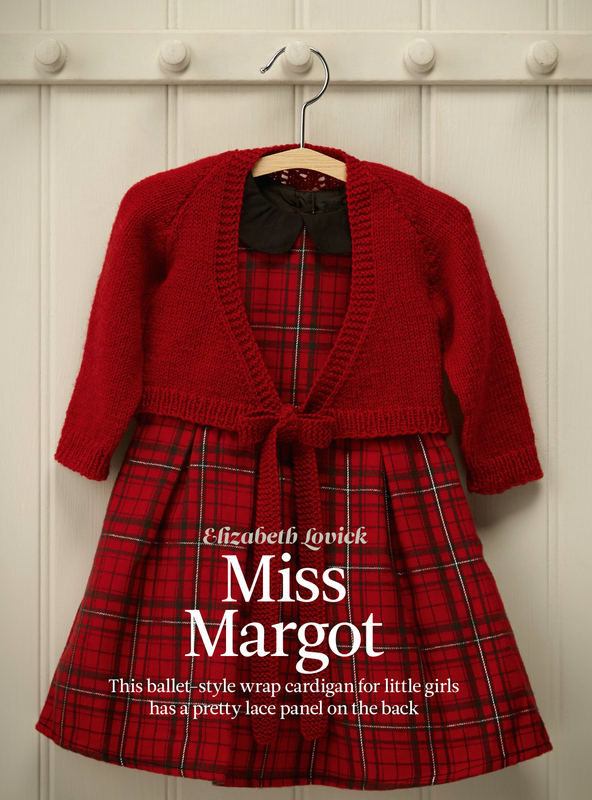 This wrap for little ladies by Elizabeth Lovick is knitted using Brown Sheep Wildfoote Luxury Sock (4ply weight, 75% wool, 25% nylon). Knitable in 10 sizes to fit chest from 43cm (17′) to 64cm (25′). 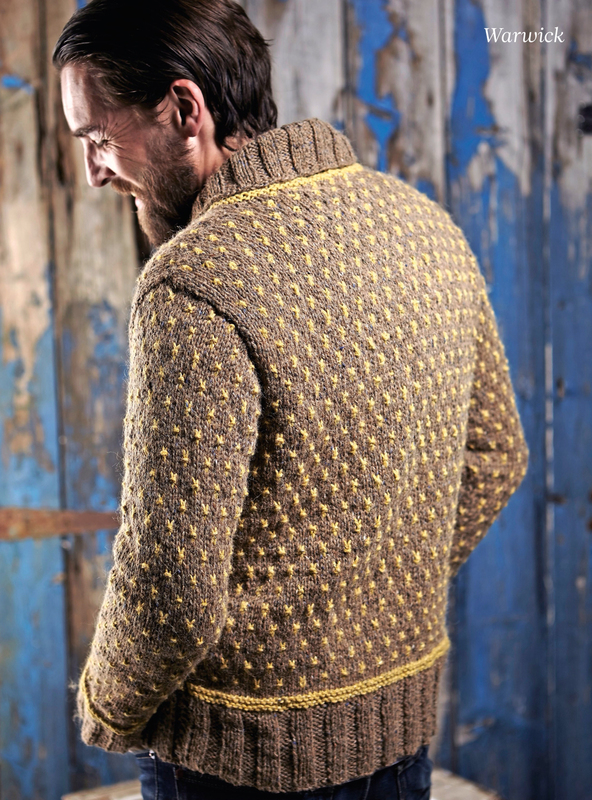 This men’s sweater was also published in The Knitting Magazine. 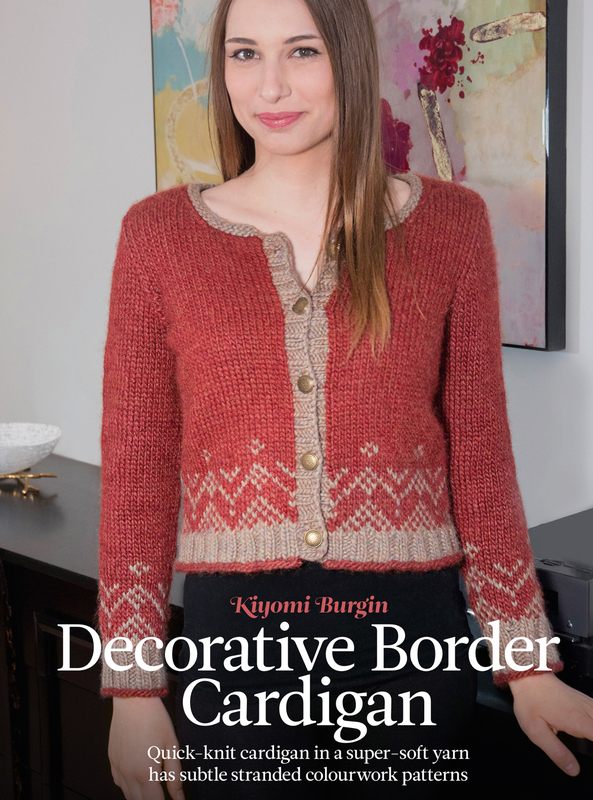 This lovely cardigan with a fair-isle border is designed by Kiyomi Burgin. The body is worked in one piece and divided at the armholes. Shown here in Mirasol Sulka (Chunky weight, 60% merino wool, 20% silk, 20% alpaca). Knitable in 5 sizes to fit bust from 78cm (30¼’) to 118cm (46½’). These beautiful table clothes are designed by Dee Hardwicke using Rowan Fine Tweed. 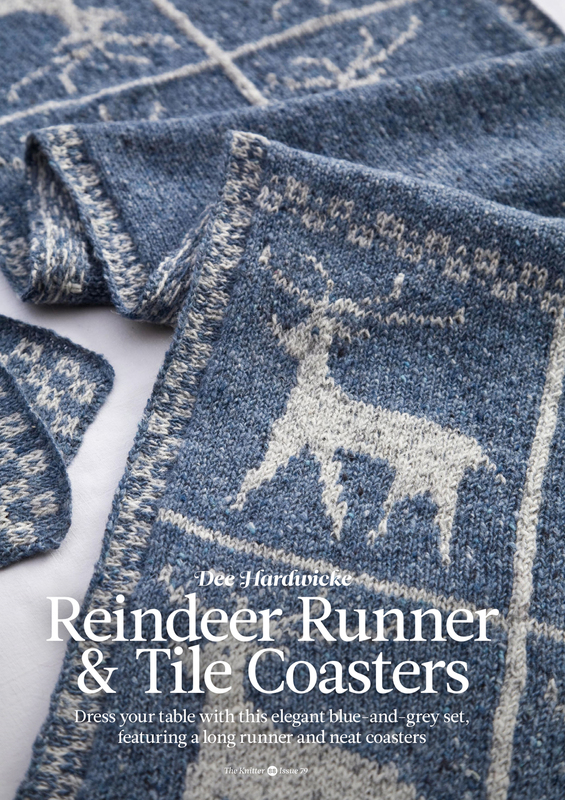 The table runner is showing a reindeer motif, whereas the coasters are repeating the dividing checkerboard motif of the Reindeer Runner. 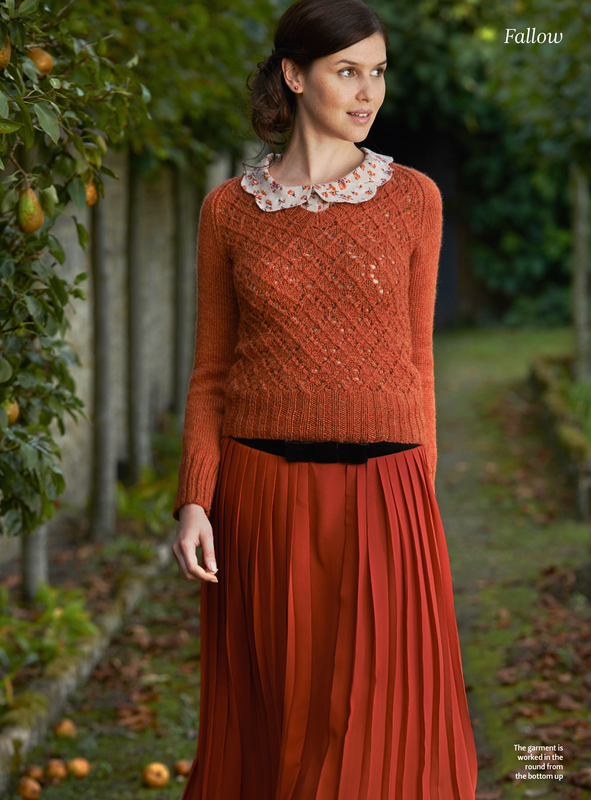 These designs by Dee are taken from her ‘Little Colour Knits’ published by Rowan. A while ago The Knitter Magazine 78 arrived on my iPad. This issue comes with 12 patterns. Elegant ways to knit some Christmas Luxury. Meet Erika Knight: The iconic British designer is sharing the story of her long career in knitwear and her new adventures in yarn production. Penny Batchelor is talking about her Christmas caution in the Guest column.. Learn cabling without a cable needle with Jen Storey in The Knitters Masterclass. And finally share some time with Susan Crawford, because it’s shearing time on her farm in her guest column “Shear hard work!”. 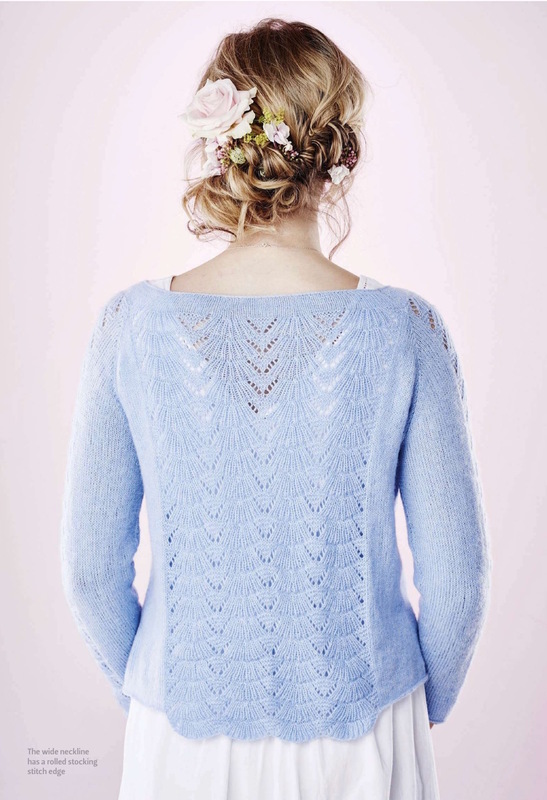 Cables and lace meets in this design by Maria Magnusson. The lacy Argyle is knitted in the round from the bottom up. The sleeves are joined in and the work is then divided at the front for the neck-opening and is continued knitting in back and forth rows. Maria Magnusson used Debbie Bliss Bluefaced Leicester DK (DK weight; 100% wool) for her lovely design. Knitable in 6 sizes to fit bust from 31in (78,5cm) to 44in (112cm). 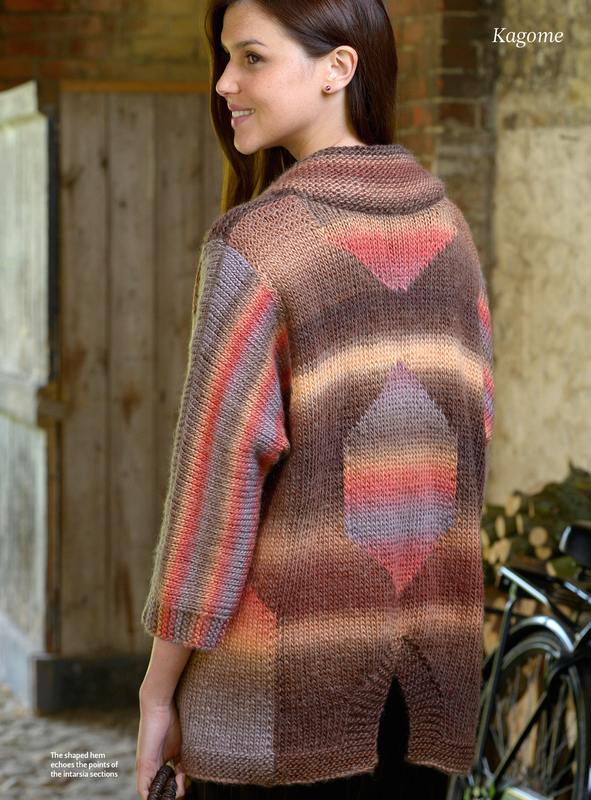 A central cable pattern is surrounded by mesh stitch pattern on this design by Yorkshire yarn company Wendy. It is shown here in Wendy Merino DK (DK weight; 100% wool) in shade Fennel. It is looking really stunning! Knitable in 6 sizes to fit bust from 32in (81m) to 42in (107cm). 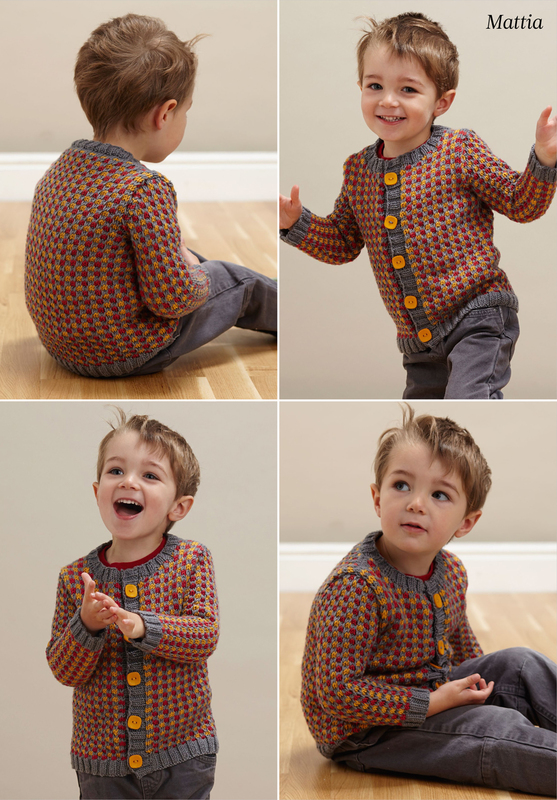 This lovely checkerboard cardigan for children is knitted from the bottom up in three separate pieces. The body is worked in one piece until the armholes and then divided for fronts and back. After joining the shoulder seams with a three-needle cast-off the front-bands are picked up and knitted. The pattern is formed using slipped stitches. Marina Orry has used Debbie Bliss Baby Cashmerino DK (DK weight; 55% wool, 33% microfibre, 12% cashmere) for her design. Knitable in 10 sizes to fit chest from 16½in (42cm) to 23¾in (60cm). Lisa Richardson designed her sleeveless top combining Rowan’s airy Kidsilk Haze (2ply/laceweight; 70% mohair, 30% silk) with sparkling Anchor Artiste Metallic (4ply weight; 80% viscose, 30% metallized polyester). The pattern is formed using slipped stitches and is framed from stripped garter stitch edgings. Side seam shaping is done for a more flattering look. Knit it and sparkle through those winter nights to come! Knitable in 10 sizes to fit bust from 32in (81cm) to 50in (127cm). This semi-circular beaded shawl by Anniken Allis is knitted using Fyberspates Gleem Lace (Laceweight; 55% superwash Bluefaced Leicester, 45% silk). It is featuring a Russian cast-off and adding beads using a crochet hook. I love it! Size: Width along top edge: 63in( 160cm), depth 29in (73cm). A G&T please. Linda Parkhouse was inspired by cracked ice for this design called “Cracked Ice”. A truly amazing design. Using an metallic thread against a aubergine background this design is knitted in fair-isle technique. The pattern is only on the front, the back is knitted in stockinette stitch. All edges are formed by a welt pattern and changing needle sizes are producing a subtle side shaping. Shown here in Rico Design Essentials Soft Merino Aran (Aran weight; 100% wool) and Rico Design Fashion Metallisé (Aran weight; 58% polyester, 42% wool). Knitable in 5 sizes to fit bust from 32-34in (81-86cm) to 48-50in (122-127cm). Another sparkling garment. This time in Rico Design Essentials Cotton Lurex 4ply (4ply weight; 97% cotton, 3% polyester). This sweater by Pat Menchini shows a medallion lace paternal pattern. It is featuring a raglan sleeves. All pieces are knit separate and after joining the raglan seams the life stitches of back, front and sleeves are knitted in a rib pattern for the neckband. Knitable in 6 sizes to fit bust from 30-32in (76-81cm) to 50-52in (127-132cm). 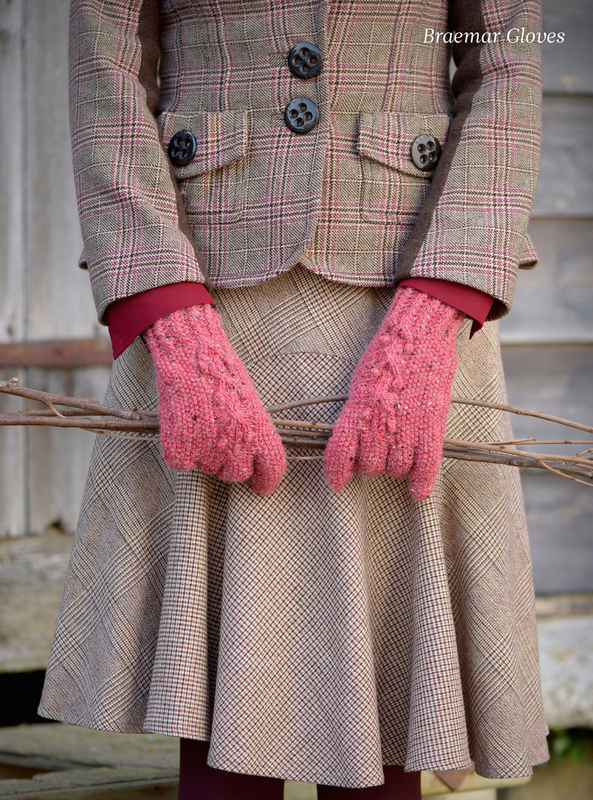 These mittens by Jen Storey are featuring different cable patterns on the back of the hand. Shown here in Quince & Co. Chickadee (Baby/sport weight; 100% wool) shade Lichen 126. To fit an average woman’s hand. Circ. 7½in (19cm), unstretched, length: 11¾in (/30cm). 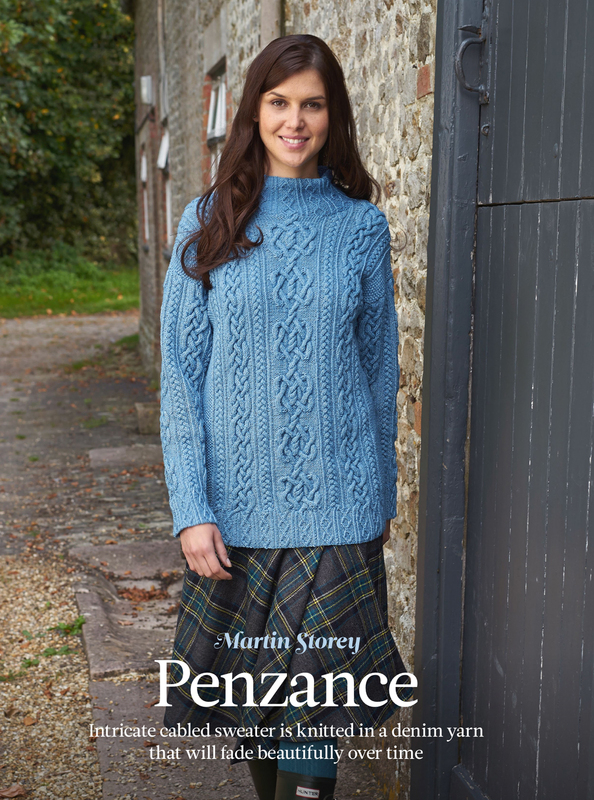 “The King of Bling” Gyles Brandreth and his daughter Saethryd have published this pattern in their brand new book “Novelty Knits” by Gyles and Saethryd Brandreth, published by Kyle Books. This sweater is showing flying ducks knitted using intarsia technique and is shown here in King Cole’s Merino Blend DK (DK weight; 1ß00% wool) yarn. Knitable in 5 sizes to fit bust from 34¼in (86cm) to 42in (107cm). A lace leaf pattern is used for these socks, knitted in Eden Cottage Yarn BFL Sock (4ply weight; 100% Bluefaced Leicester wool). Rhian Drinkwater design these toe-up socks featuring Judy’s Magic Cast-On method. Knitable in 3 sizes to fit foot circumference from 8in (20cm) to 9½in (24cm). 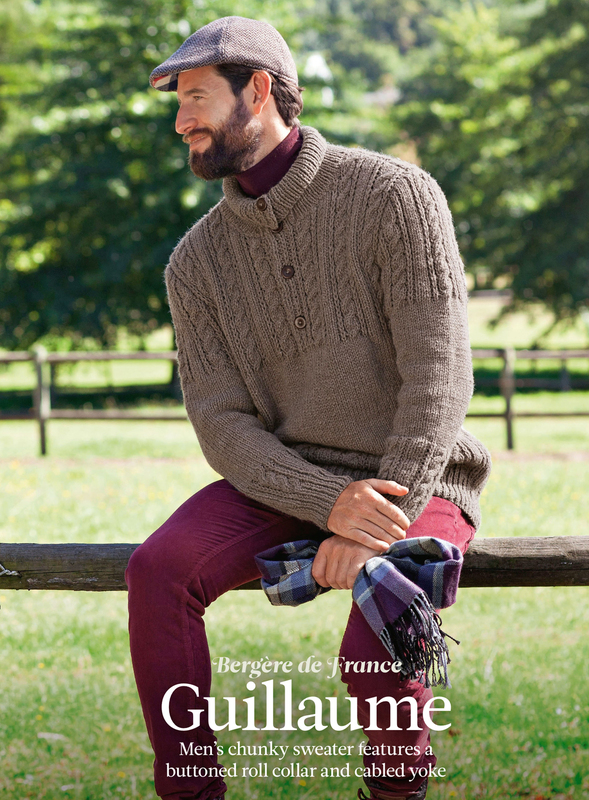 This two-tone fair-isle sweater by Bergère de France is knitted flat. This patter is originally published in Créations 2014/15 from Bergère de France. It is knitted in their Barisienne (DK weight; 100% acrylic) yarn. Knitable in 5 sizes to fit chest from 31½in (80cm) to 44¾in (114cm). 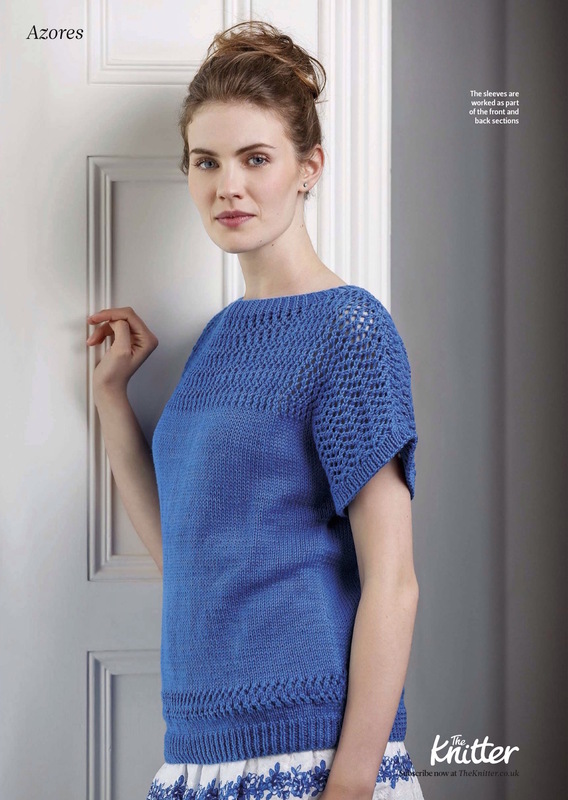 Marie Wallin’s design Ness is originally published in the latest Rowan Knitting & Crochet Magazine 56. 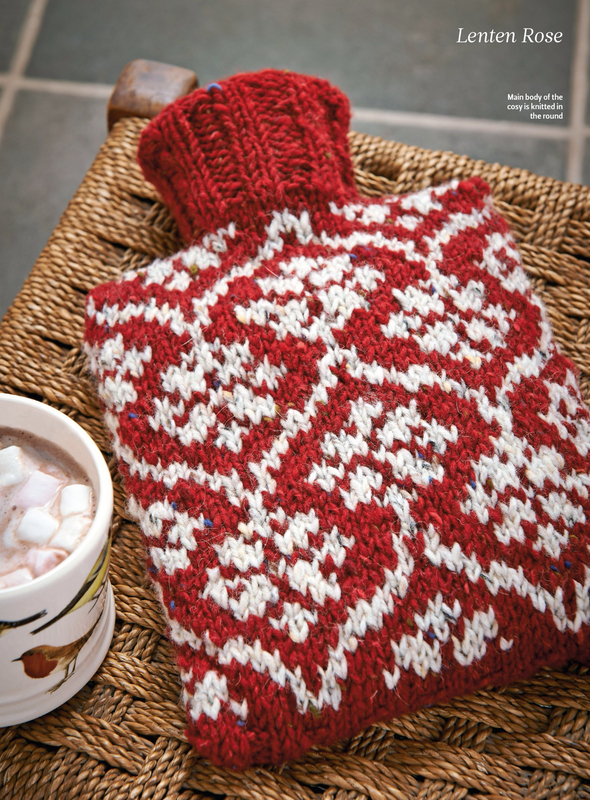 It is showing a stunning fair-isle pattern atop a cable pattern. It is knitted using 3 different Rowan yarns: Rowan Tweed (DK weight; 100% wool), Rowan Frost (Aran weight; 20% alpaca, 80% viscose) and Rowan Colourspun (DK weight; 72% wool, 14% mohair, 14% polyamide). This design is knitted flat. I’m tempted! 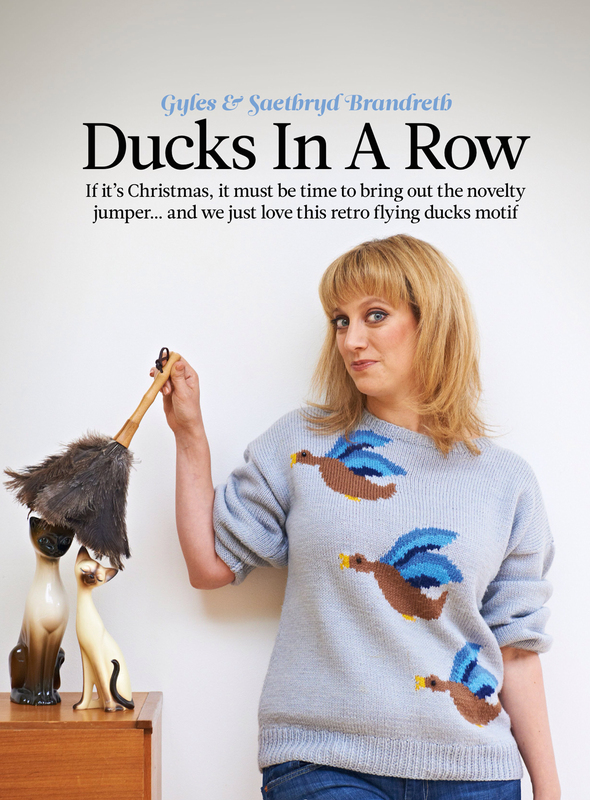 The next issue of The Knitter has arrived today on my iPad. 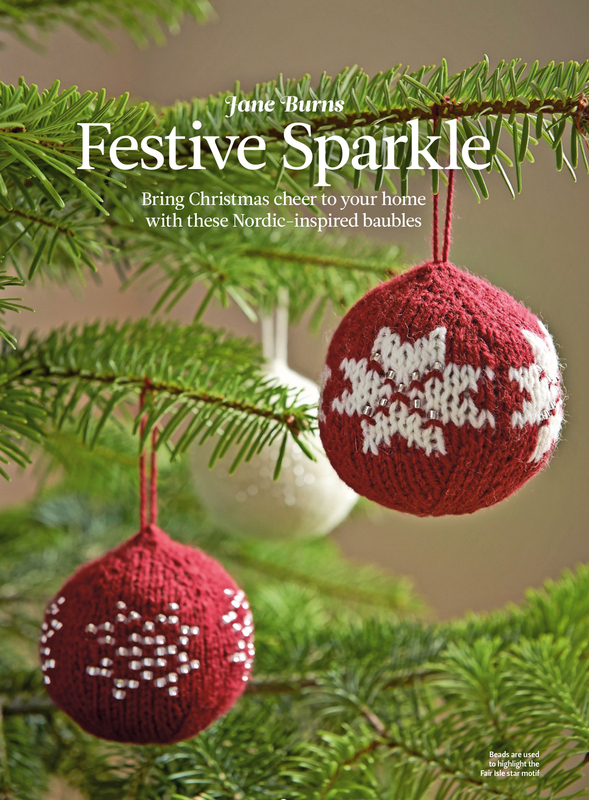 It is featuring exclusive designs from Katya Frankel, Judy Furlong, Mary Henderson, Martin Storey, Emma Vining … and more. And it is showing exciting ways with yarn, from the art of Ruth Lee to the catwalk knits of Wool And The Gang. A while ago The Knitter Magazine 77 arrived on my iPad. This issue comes with 20 patterns. Gorgeous garments and accessories to knit for Christmas. Rita Hamburgh is reporting about Bristol’s first Wool fair in her article “Go west for wool!! Meet Amanda Crawford, who is passionate about textures and created a whole lot of designs for “The Knitter”, Rowan, Patons and Vogue Knitting. Amanda is talking about her new projects and her busy career. By the way, in summer she was appointed head designer at Stylecraft. Clare Devine takes you onto a marvelous journey between science and knitting. Discover the “Norwegian Purl” stitch used when knitting Continental style with Fay Perriam in The Knitter Masterclass. And finally read about the changes of choosing a flock of sheep in “Welcome to ewe all” by Susan Crawford. Isn’t it beautiful? This fair-isle scarf by Mary Henderson is casted on using a provisional cast on and then knitted in the round! At last the ends were crafted together and the wrong side is hidden inside the scarf. Brilliant! Mary Henderson used 5 shades of Alice Starmore Hebridean 2ply (2ply weight, 100% pure new wool) from Virtual Yarn for this design. Finished size 19 cm (7½in) wide and 137cm (54in) long..
Cables and lace are the components of this “quick-to-knit” hat. 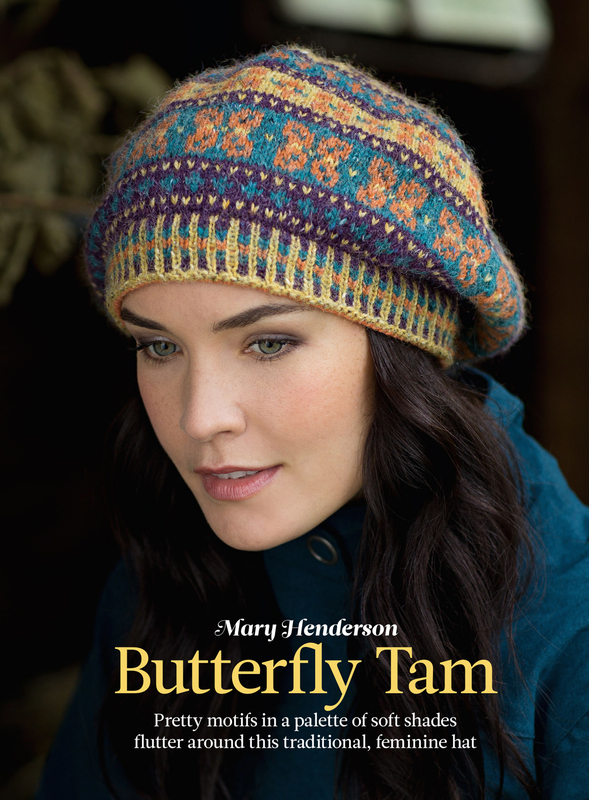 Helen Ardley used Harrisville Designs’ Highland (Aran weight, 100% wool) yarn for this design. The matching scarf will be published in the next issue of The Knitter Magazine. 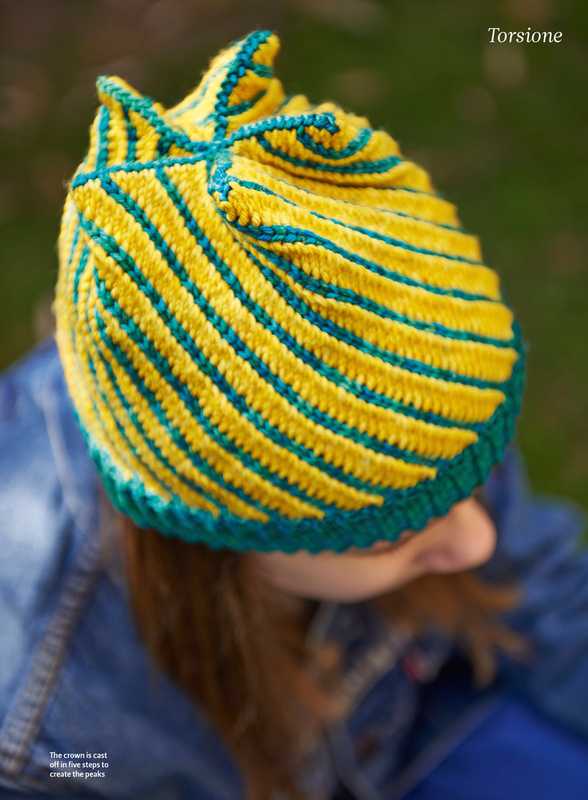 Knitable to fit an average adult woman’s head 50 – 56cm circumference. 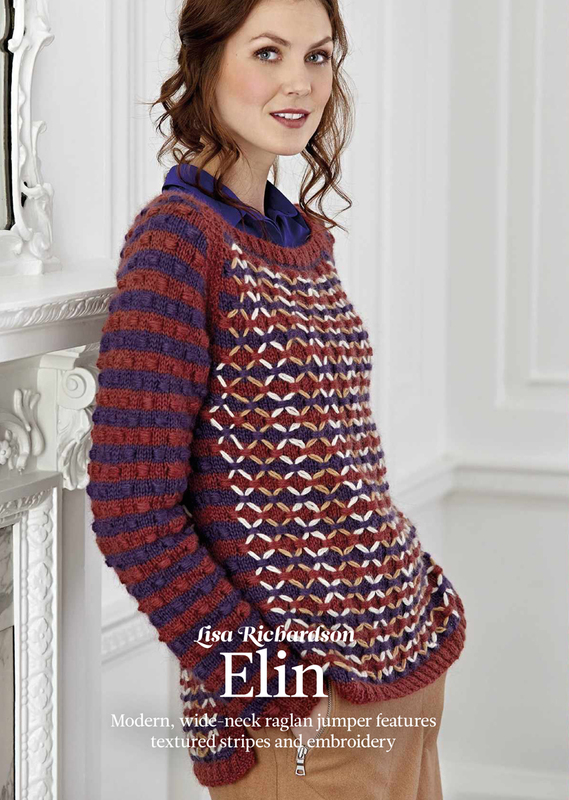 This stunning sweater a design of Lisa Richardson is knitted in Rowan’s new yarn Rowan Finest (4ply weight, 20% cashmere, 50% extra fine merino wool, 30% alpaca). 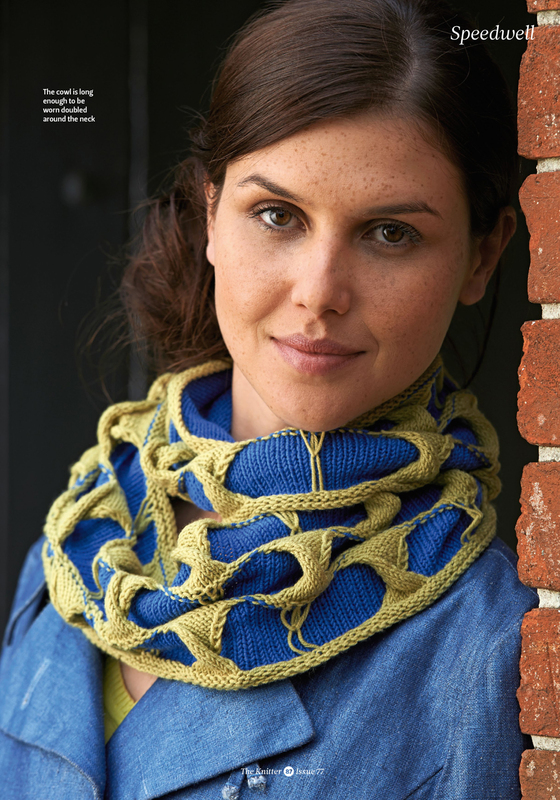 This pattern is created by cables, increases and decreases and produces a “leaf-like texture”. The cables are floating from one side to the other surrounding a rib pattern (ktbl, p). This pattern is originally shown in the Rowan brochure Denim – The Next Generation. 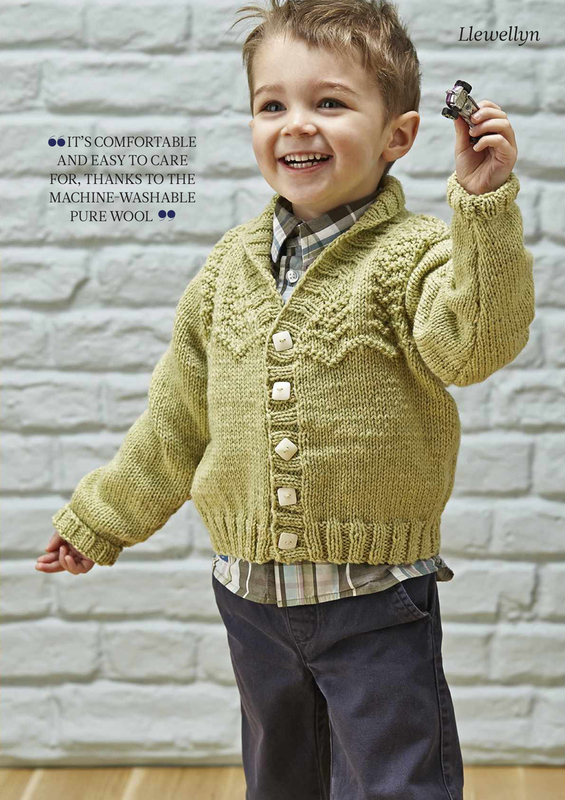 It is featuring Rowan’s ever popular Denim (DK weight, 100% cotton) yarn. Now available as Original Denim. I have already blogged about this brochure and of the shrinkage nature of this yarn. Martin Storey, well known for his cables, shows here a firework of different cables, which getting more prominent, because of the shrinking of the yarn after washing it the first time. This jacket by Emma Vining is knitted using intarsia technique and is influenced by “Sashiko” – the traditional Japanese quilting style. The back and fronts are knitted separately, the sleeves are shaped at the same time by simply increasing stitches. Emma used King Cole Riot Chunky (Chunky weight, 70% acrylic, 30% wool), a variegated yarn for her design. It is featuring ¾-length dolman-style sleeves. Knitable in 4 sizes to fit bust 30-34in (76-86cm) to 48-52in (122-132cm). Amanda Crawford designed these lovely gloves using Stylecraft Alpaca Tweed DK (DK weight, 77% acrylic, 20% alpaca, 3% viscose). They are featuring cables and bobbles on the back of the hand. These gloves are knitted flat and later seamed together. (This is a very unusual technique for me to knit gloves, but…). Shown here in shade Cherry, they will also look great in shade Ocean, Sage or Plum. Knitable to fit a women’s medium size hand, approx. 7½-8½in (19-21cm) circumference. 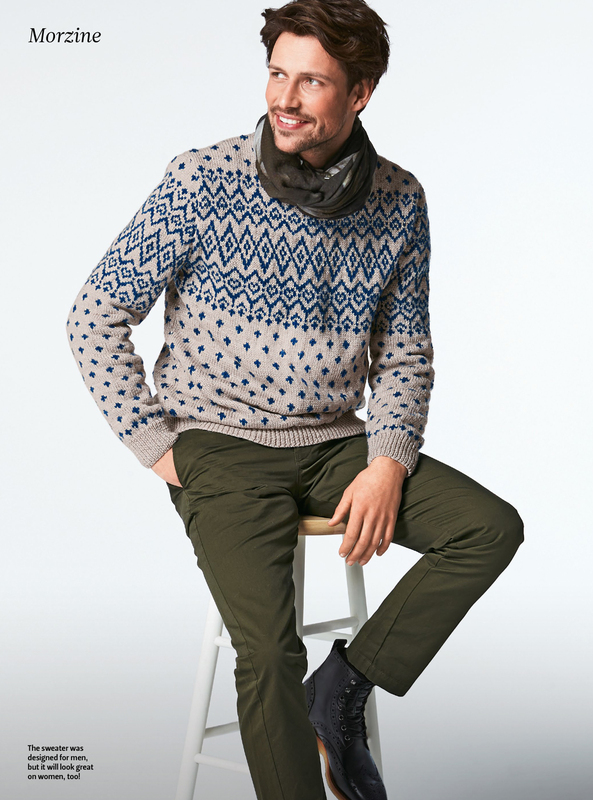 The pieces of this sweater are first knitted flat, afterwards the stitches for the yoke with its fair isle motif are picked and knitted in the round. At last the garment is blocked and the raglan, side and sleeves seams are joined. Debbie Bliss used 3 different yarns for this design. The background is knitted using Debbie Bliss Fine Donegal (4ply weight, 95% wool, 5% cashmere) and Debbie Bliss Angel (Laceweight, 76% mohair, 24% silk) held together to produce a fuzzy appearance. 5 shades of Debbie Bliss’ Rialto 4ply (4ply, 100% wool) yarn are used for the fair isle motif. Knitable in 7 sizes to fit bust from 32in (81cm) to 44in (112cm). 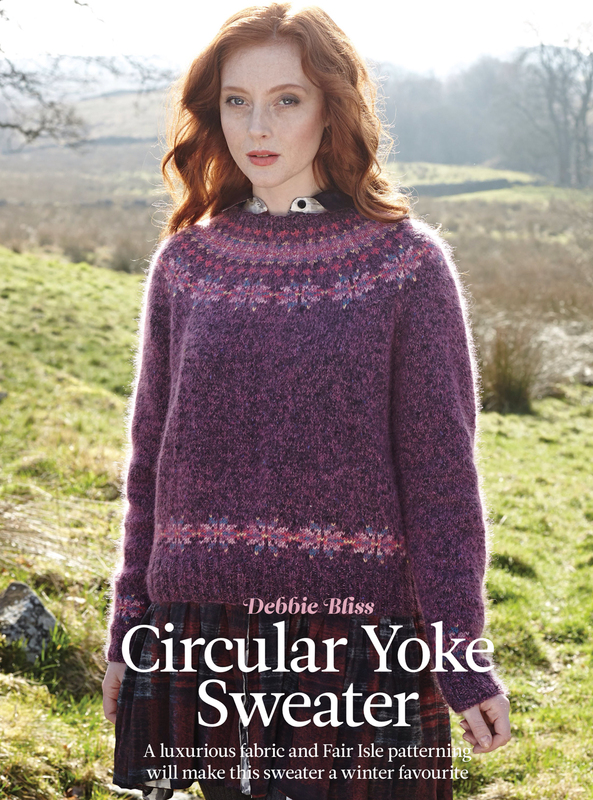 This pattern is originally published in Fine Donegal, a book with 12 patterns featuring Debbie Bliss’s new yarn. For more information go to www.designeryarns.co.uk. Every girl needs a cardigan. This one by Jenny Watson is lovely. It is showcasing nice cables on back and fronts, which are worked in one piece from bottom to top and divided at the armholes. The sleeves are knitted separately and sewn into place before joining the seams. 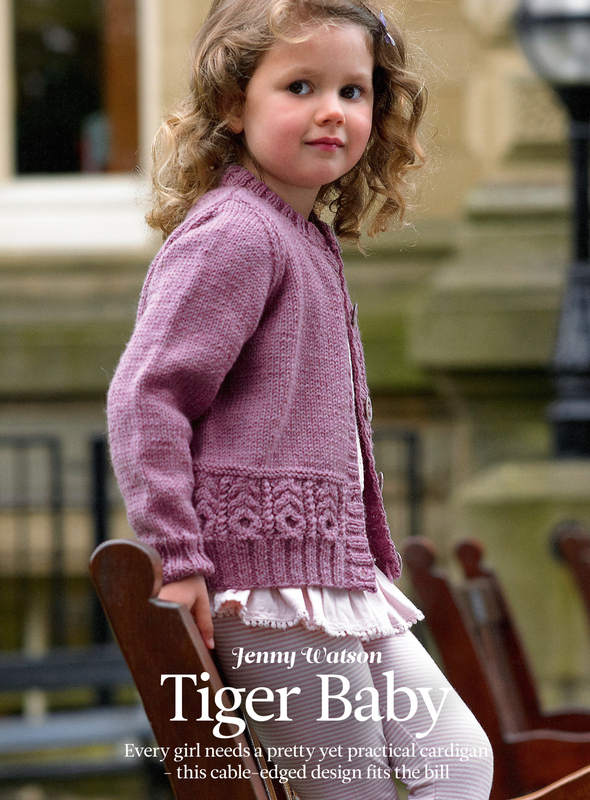 Jenny Watson used West Yorkshire Spinners’ Aire Valley DK (DK weight, 75% wool, 25% nylon) yarn for her design. It is shown here in shade 530 Pennyroyal. Knitable in 6 sizes to fit chest from 20in (51cm) approx. 3-4 yrs to 30in(76cm) approx. 12yrs. This pattern is taken from Quintessential DK, a collection of pattern for all the family by Jenny Watson for West Yorkshire Spinners. For more information visit www.wyspinners.com. How about a cushion. This one by Sasha Kagan is especially beautiful. 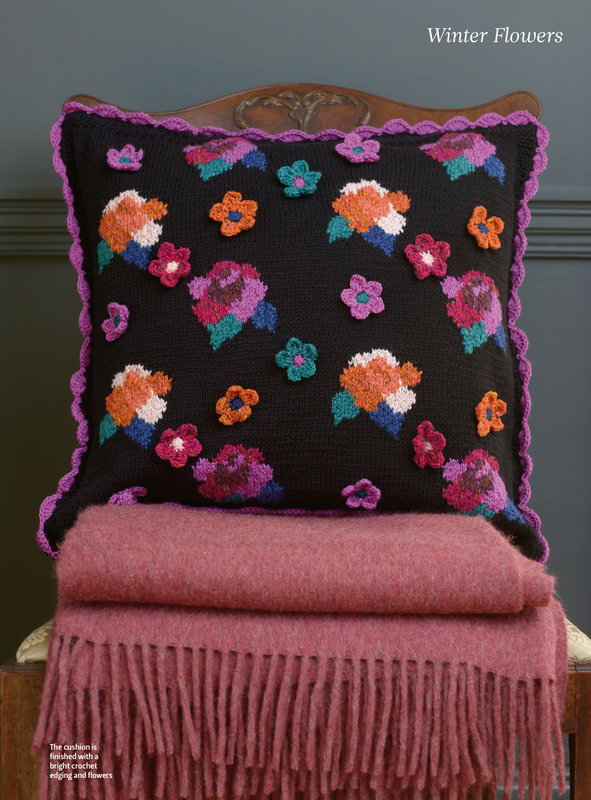 Some flowers on the front of this cushion are knitted into the front section using intarsia technique. 16 crocheted flowers are sewn on later to the front section. Two back sections are knitted in moss stitch and joined to the front section with crochet stitches and a shell edging. Sasha Kagan used 5 shades of Rowan Baby Merino Silk DK (DK weight, 66% wool, 34% silk), 1 shade of Rowan Wool Cotton DK for the background (DK weight, 50% wool, 50% cotton) and 3 shades of Rowan Tweed (DK weight, 100% wool). Size 19½in x 19½in (50cm x 50cm) . 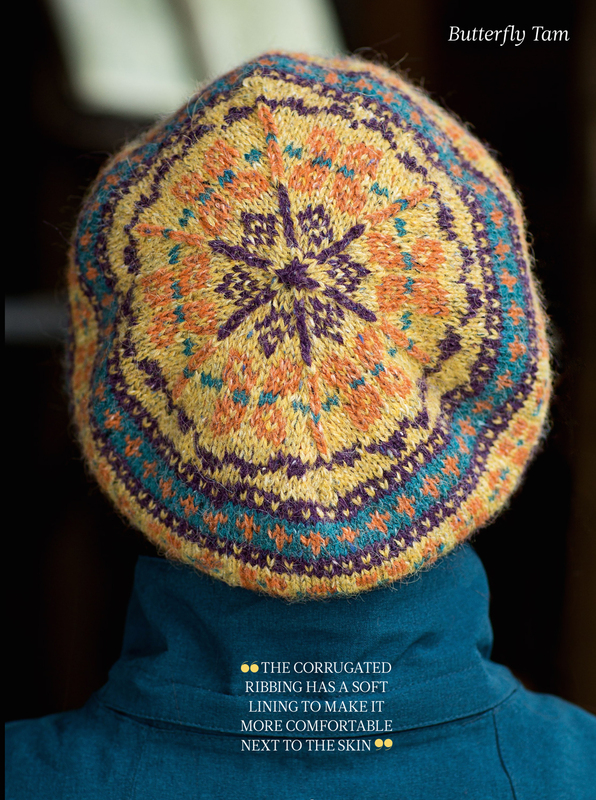 “Hat Architect” Woolly Wormhead (The Knitter Magazine) has created this interesting hat for children. Special techniques are used to make this hat in Fyperspates Vivacious DK (DK weight, 100% merino wool). Woolly Wormhead is providing tutorials for these techniques for download on her website. (www.woollywormhead.com). The body of this hat is knitted in the round and the crown is cast off in five steps. Knitable in 5 sizes to fit head circumference from 14in (35.5cm) to 22in (56cm). Finished size 9in (23cm) circumference. You may stone me to death, but I definitely would find another use for Debbie Bliss’ Baby Cashmerino (Baby/sport weight, 55% wool, 33% microfibre, 12% cashmere). Actually I think this adjoins animal abuse! If you like to join other animal tormentors you may like Wooly Woofers, the new book from Debbie Bliss with more than 20 knitwear designs for dogs. For more information you may look on www.quadrille.co.uk. Arne & Carlos the Scandinavian design duo are responsible for this sweater. 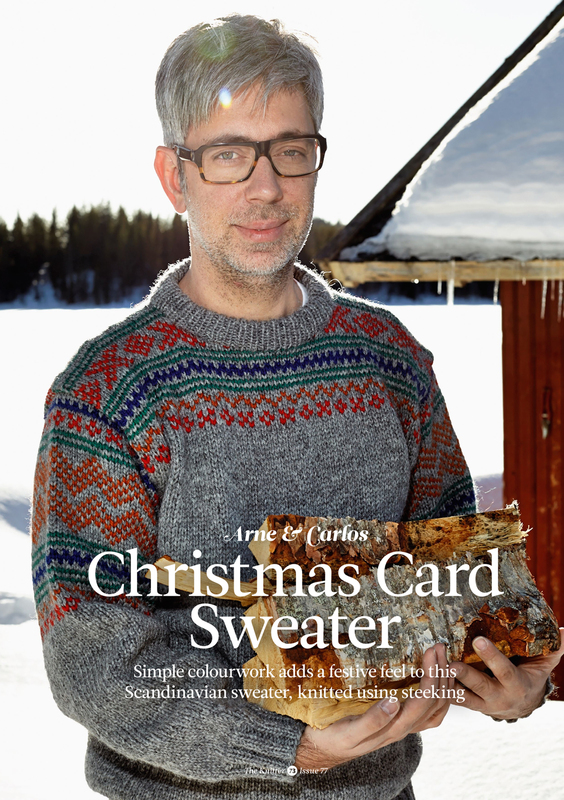 Tis is named Christmas Card Sweater, because it is “inspired by old Christmas cards found in the attic of Arne’s grandmother in Setesdal, Norway” (The Knitter Magazine). Both, the body and the sleeves are knitted in the round from bottom to top. The armhole and neck openings are secured by machine-stitches and cut open. A challenge to knit therefore. Shown here in 5 shades of Rauma Varnsegarn (Aran weight; 100% wool). Alternative yarn suggestion Drops Alaska (Aran weight, 100% wool). Knitable in 4 sizes to fit chest from 38in (97cm) to 44in (112cm). These beaded wrist warmers by Jane Burns are knitted in the round, using hand-dyed sock yarn Spirit (4ply weight, 75% superwash merino wool, 25% nylon) from Sparkleduck. Size 8 seed beads from Debbie Abraham Beads. This design by Lousia Harding is offered in two different versions. Both are knitted using Louisa Harding’s Akiko (Aran weight, 70% merino, 30% alpaca) for the main body and Luzia (Super-chuny weight, 80% viscose, 30% nylon) a faux-fur yarn for the collar and cuffs. Back and fronts are knitted in one piece to the armholes. The set-in sleeves are knitted flat and eased into armholes. Both versions knitable in 10 sizes to fit bust from 30in (76cm) to 48in (122cm). This nice cowl is showcasing elongated stitches and twists in two colors of Drops Baby merino (Baby/sport weight, 100% wool). This hot water bottle cosy is lovely. 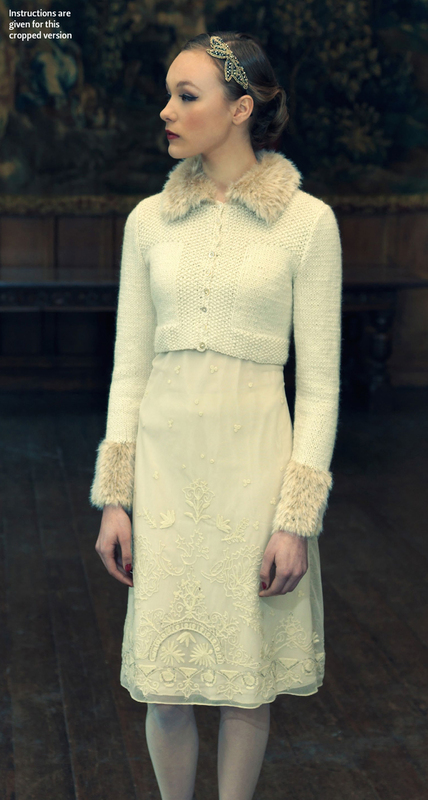 Kirstie McLeod used Debbie Bliss’ Donegal Luxury Tweed Aran (Aran weight; 90% wool, 10% angora) for her design. 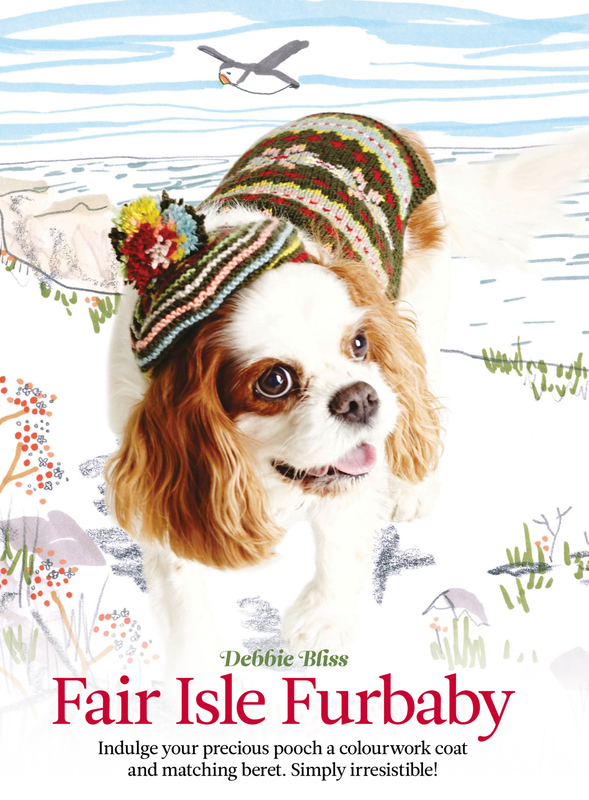 It is featuring a lovely all-over fair isle pattern. Rachel Coopey’s socks are featuring texturing stripes. Shown here in West Yorkshire Spinners Signature 4 Ply (4ply weight, 75% wool, 25% nylon). These socks by Barb Brown are for men only! “Their comfortable style makes them perfect for wearing with walking boots or wellies.” (The Knitter Magazine) Shown here in Red Heart Sport Socks (3ply weight, 75% superwash wool, 25% polyamide). 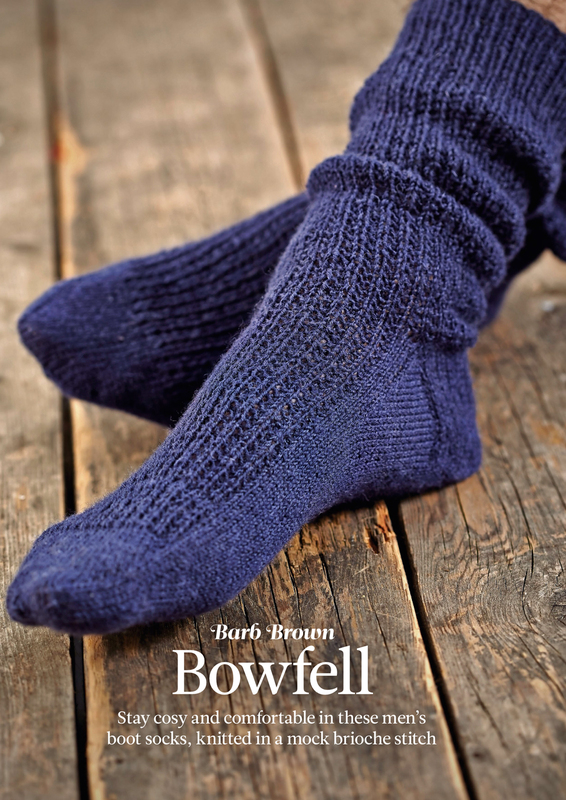 Heel and toes are also included into the pattern of Annja Belle’s top down socks with a short row heel. Double knitting techniques are used for this reversible colourful socks to produce a warm and cosy pair of socks. Shown here in a solid and a variegated sock yarn of Schachenmayr Regia Cracy Colour 4 Ply (4ply weight, 75% wool, 25% nylon) and Schachenmayr Regia Solid 4 Ply (4ply weight, 75% wool, 25% nylon). The next issue of The Knitter will be on sale November 11. It will feature exclusive designs from Anniken Allis, Maria Magnusson, Lisa Richardson, Marie Wallin, Marina Orry … and more. And you will get ideas for your Christmas gifts and will have a look at Japanese yarns. Today The Knitter Magazine 76 arrived on my iPad. 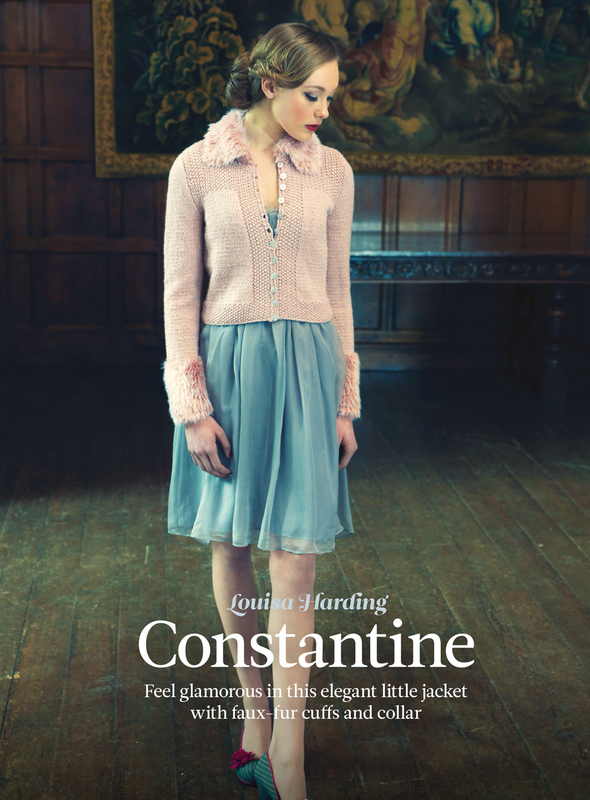 This issue comes with 13 patterns, featuring fitted styles and inspiring shapes. 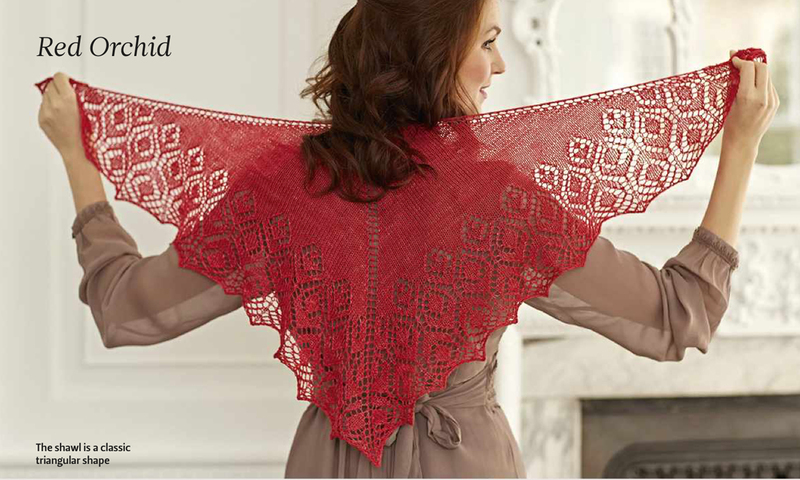 And there is a Autumn shawl booklet, too. Be inspired by Designer Mary Henderson who is sharing her secrets for creating stunning fair-isle colour schemes in the Designer story “Colour wonder“. 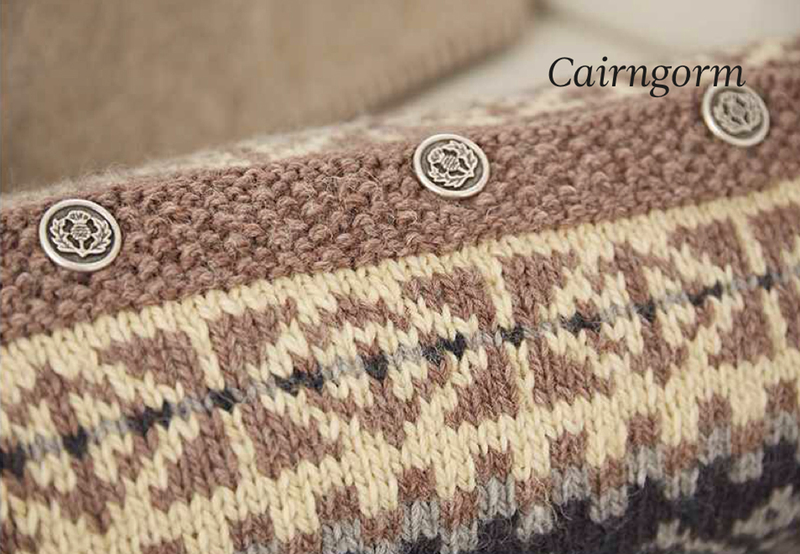 Follow Susan Crawford in her journey making Shetland’s pattern archives available to todays knitters. Penny Batchelor has had a chat about this “very vintage” topic of conversation. Follow Penny Batchelor’s blog which is specialized on crafts. And follow her to Norway in her article “Nordic memories” reporting about the Norwegian Knitting Industry Museum. In this Knitter Masterclass Faye Perriam unveils her “top tips” how to use the Continental method to speed up your knitting. Finally “Meet Lisa Richardson” the “Top Rowan designer Lisa has an inspiring portfolio of knitting at terns that’s a credit to her creativity and imagination“. An interview. This sweater by Martin Storey is a reminiscence of the ongoing monochrome trend. The pattern is produced using slip stitches reversing the shades on the upper part of the sweater. The seater is stitched in Rowan Yarns soft Wool Cotton 4ply (50% merino wool, 50% cotton). I do love this pattern for its simplicity stitching it and for the stunning effect at last. It is also a reminder of Rowan Studio 32, which is also featuring monochrome patterns and showing the beauty of the fashion of the 60’s. Knitable in 5 sizes to fit bust 32″ (82cm) to 50″ (127cm). You may also look at Dayana’s “Switcheroo” of Sandy a design from Rowan Studio 32. 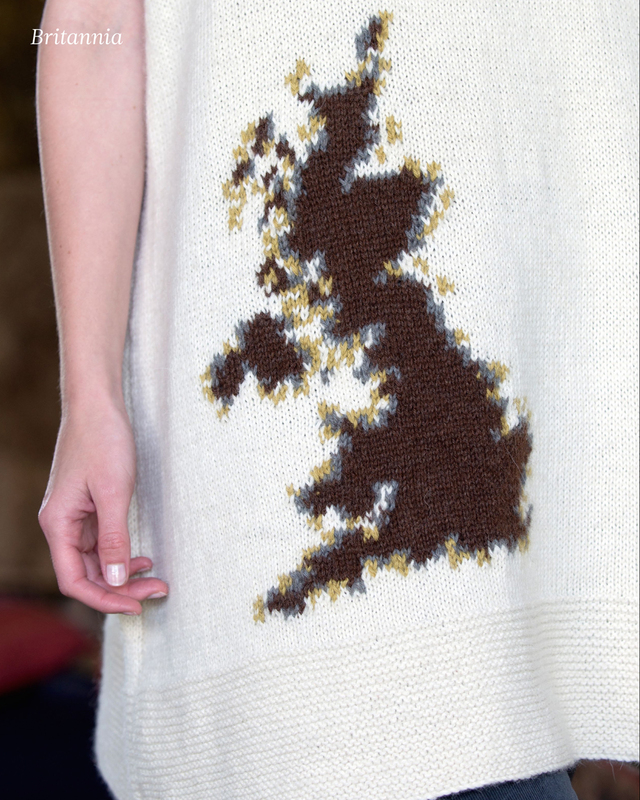 A lovely idea of Belinda Harris Raid, knitting a map of the UK on her tunic length dress. Garter stitch forms the hems on both body and sleeves as well as the neckband. The map is knitted in 3 shades of Belinda Harris-Reid‘s Double Kiss (DK weight, 70% alpaca, 30% Bluefaced Leicester wool). Isn’t it lovely? I think it looks very relaxed. 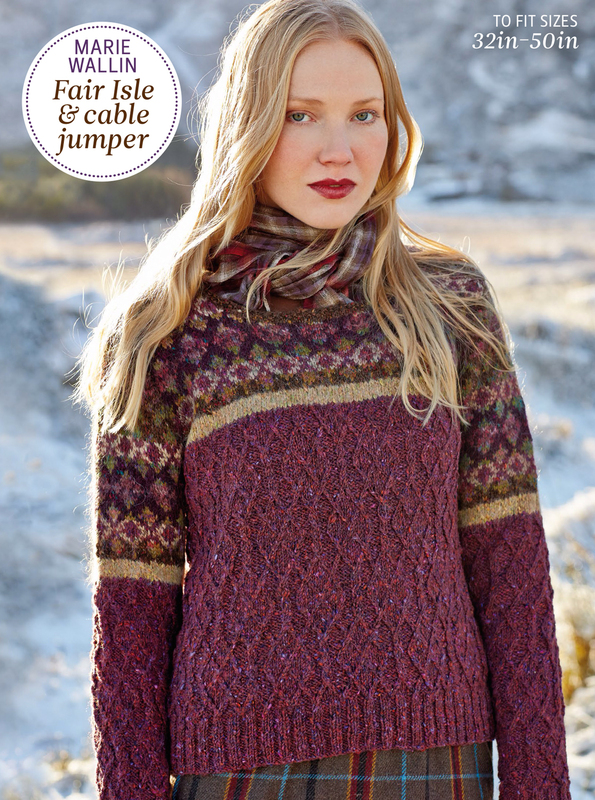 This cropped cabled cardigan features celtic cables on fronts and back. 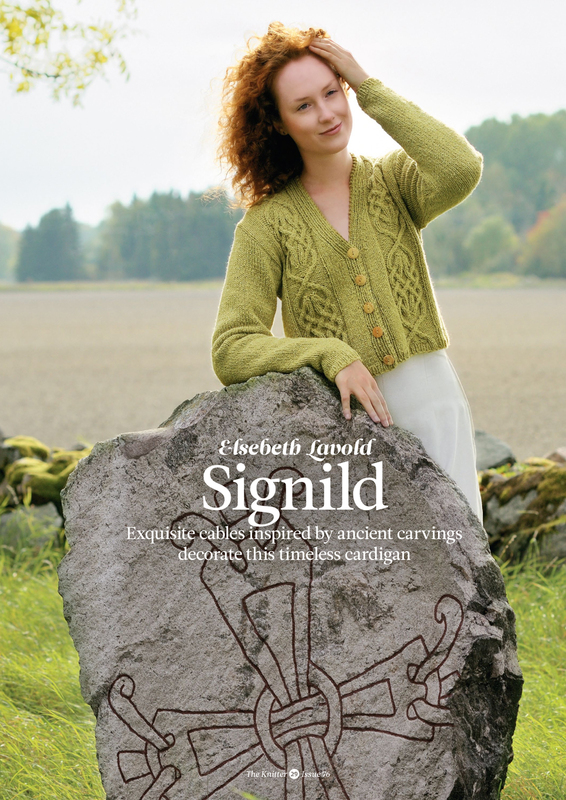 Elsebeth Lavold was inspired by Viking patterns and says “Signild is one of my absolute laborites, even though I’m not supposed to favor any one of my own designs.” I’m sure a lot of you do think the same and it will become one of your favourite garments. A great timeless pattern. The recommended yarn for this lovely cardigan is Elsebeth Lavold Silky Wool XL (Aran weight; 80% wool, 20% silk). “Because the recommended yarn is hard to source in the UK, we’ve suggested Cascade Yarns 220 (Aran weight; 100% wool) as an alternative.” The Knitter says. Knitable in 5 sizes from 37¾” (96 cm) to 47¼” (120cm) actual bust. 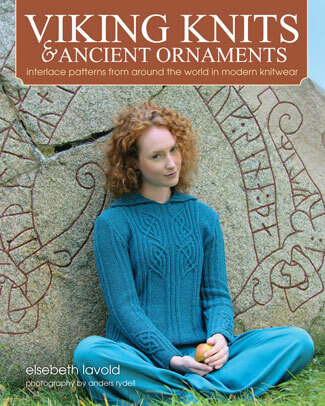 This pattern is taken form ‘Viking knits & ancient ornaments – interlace patterns from around the world in modern knitwear’ by Elsebeth Lavold published by Trafalgar Square Books. A challenge to knit and yet so beautiful. Knit this tank top in 5 shades of Jamieson’s of Shetland Spindrift (4ply weight; 100% wool) in the traditional way. This means, knit it in the round, with armholes and neck steeks, which are cut open. The stitches for the neckband and the hems on the armholes are picked up and worked in corrugated rib. Knitters, pick up the gauntlet! Knitable in 7 sizes to fit bust from 30″ (76cm) to 50″ (127cm). 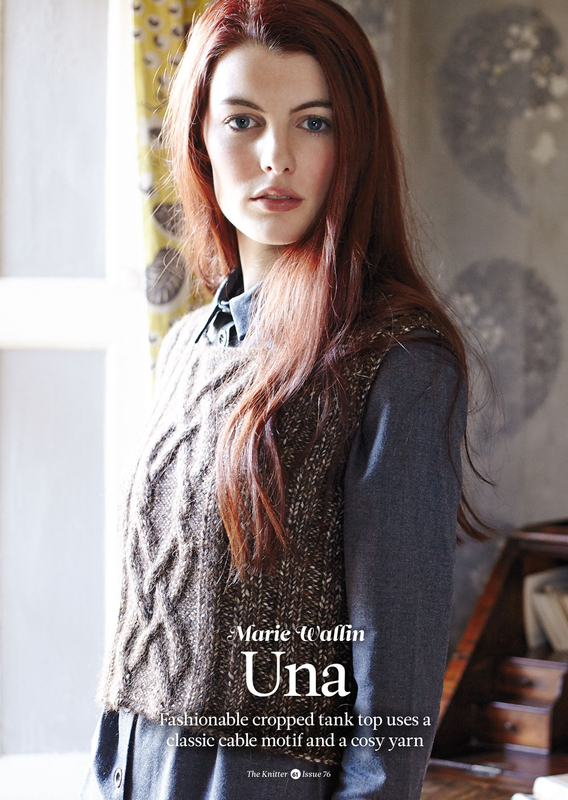 Featuring her new yarn Susurro (Aran weight; 100% baby alpaca) Louisa Harding has designed this feminine sweater. Wear it with a reversible collar stitched in Louisa Harding’s Luzia (Chunky weight; 80% viscose, 20% nylon), which is producing a faux-fur effect. This garment is knitted flat to the armholes, starting with a picot cast-on. Front, back and sleeves are then joined in the round to knit the raglan shape. The flattering shape is produced using different needle sizes. Knitable in 3 sizes to fit bust 28″ (71cm) to 36″ (91cm). 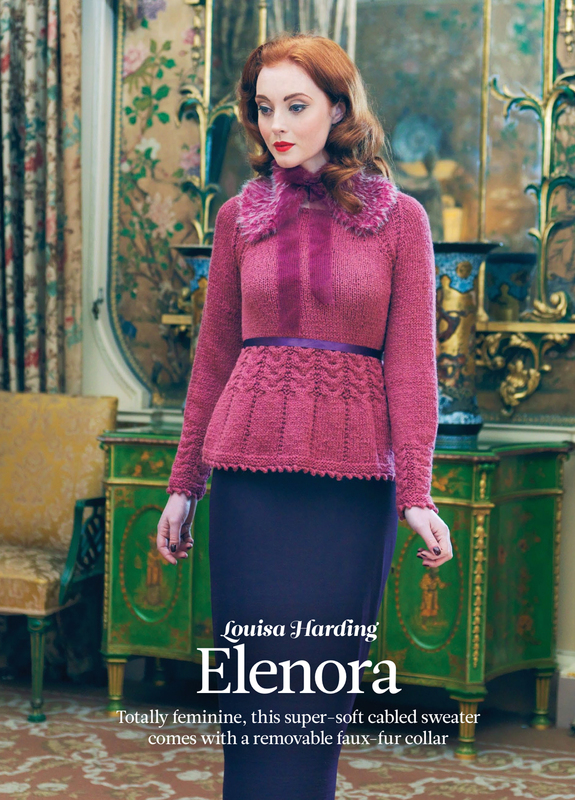 This design is taken from Susurro, a new collection of 14 feminine patterns by Louisa Harding. This cardigan is knitted using Laguna (Aran weight; 60% alpaca, 40% wool,) a self-striping yarn from Araucania, available in 10 different shades (see shade card below). This cardigan is worked flat in one piece to the armholes. The sleeves are knitted in the round and joined to the body building the yoke, which is worked in one piece showing a herringbone stitch. The front-bands are picked up and knit in a rib pattern before blocking. Knitable in 8 sizes to fit bus from 32″ (81cm) to 46″ (117cm). Ladies think about Christmas! Don’t you need a gift for a beloved man? 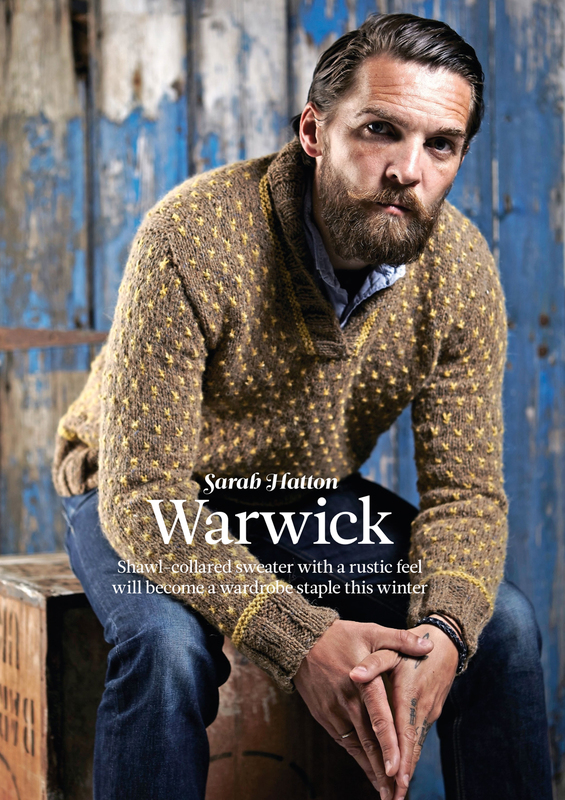 Warwick by Sarah Hatton is a great opportunity to show how much you care for your man, isn’t it? I do love, love, love this pattern and I will knit it for sure! It is worked flat using fair-isle technique, but if you look closer you see, the reversed stockinette adding depth and excitement to this sweater with its ever famous shawl collar. “A stripe in a contrast colour emphasizes the line hems and of the shawl collar, which is knitted on to the neckline using ribbing and short-row shaping.” (The Knitter) At your needles, one, two, three! And it will sure be ready for Christmas, because it is knitted in Rowan Yarns Felted Tweed Aran (Aran weight; 50% wool, 25% alpaca, 25% viscose). Knitable in 7 sizes to fit chest from 38″ (97cm) to 50″ (127cm). This cropped tank top, designed by Marie Wallin is using the new Rowan Yarns Faced Tweed (Chunky weight; 72% wool, 22% alpaca, 6% polyamide). It comes in 10 lovely shades. 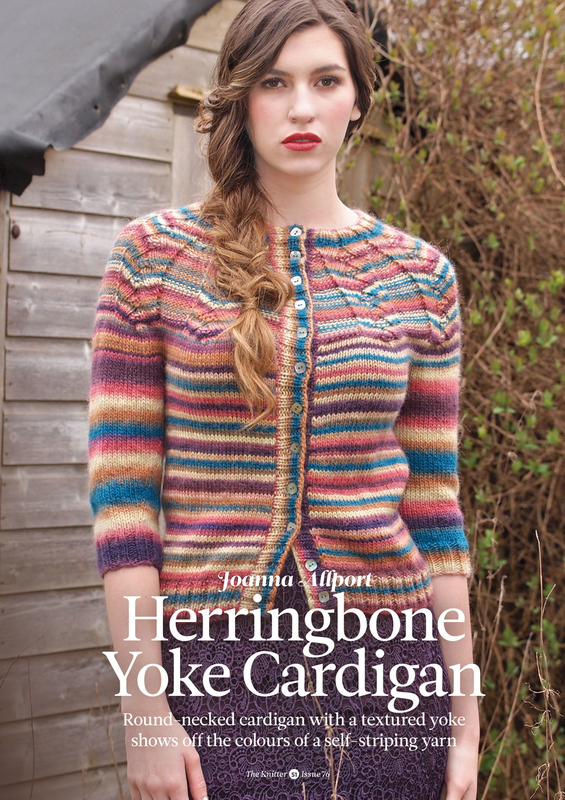 You may read the review of this yarn of PurlOne on her blog. I love this little tank top, it is a quick knit and a design you will wear every day. 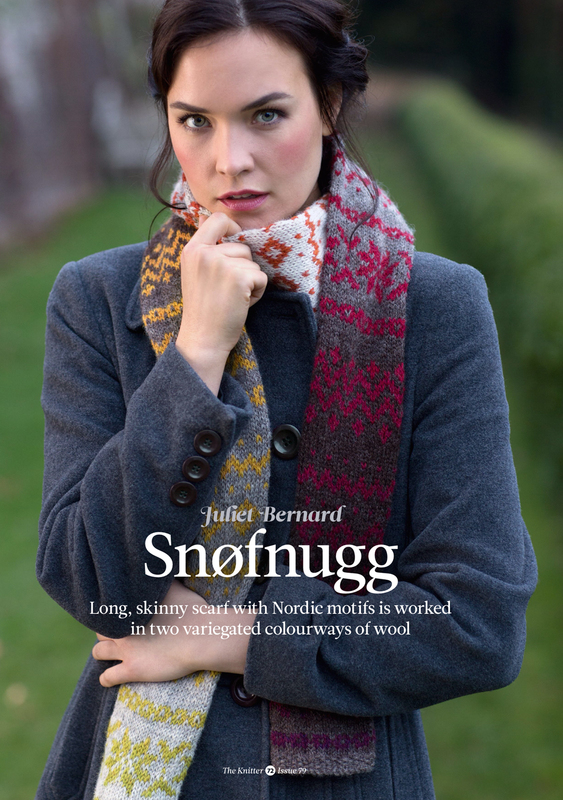 This design is originally published in Faced Tweed a new collection of 16 designs for women designed by Marie Wallin. Knitable in 5 sizes to fit bust from 32″ (81cm) to 50″ (127cm). Using 4 shades of the soft Rowan Yarns Alpaca Colour (DK weight; 100% alpaca) this vibrant sweater is designed by Lisa Richardson. The small blocks on front and back of this garment are worked using intarsia technique. The sleeves are knitted in one colour of this yarn showing its subtle tonal colour changes. Knitable in 10 sizes to fit bust from 32″ (81 cm) to 50″ (127cm). 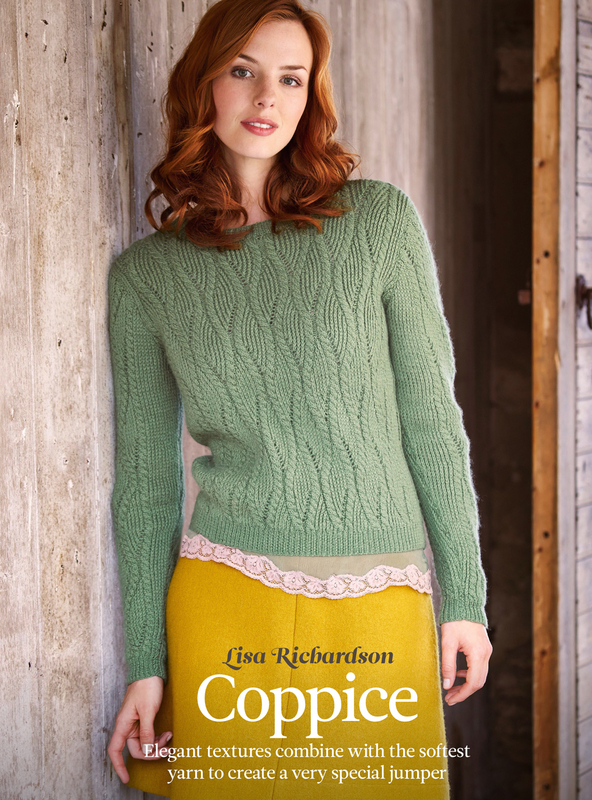 This cropped sweater by Elizabeth Lovick is one of my favourite designs in this magazine. You will later see why! 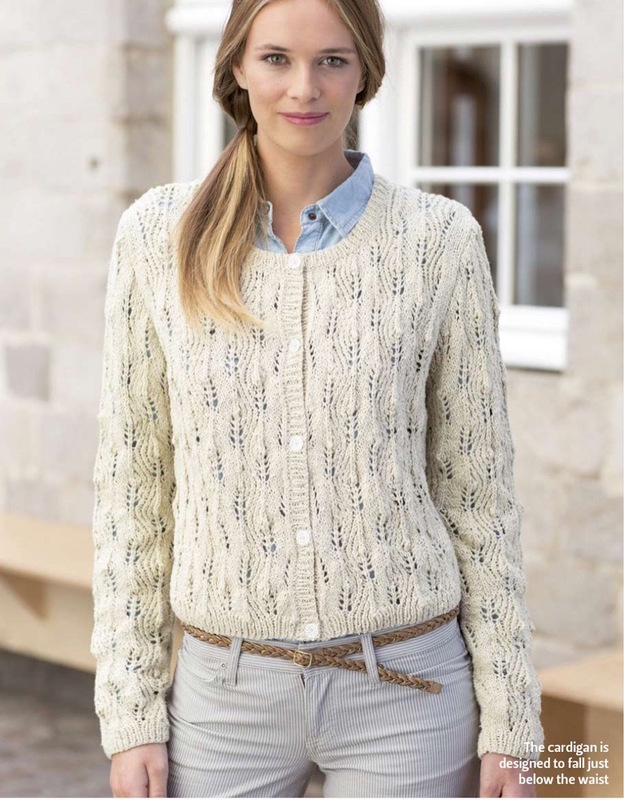 It is showing a textured pattern formed by knit and purl stitches inspired by ganseys, the traditional fishermen’s sweaters. It is shown here in Blacker Yarns Classic Aran (Aran weight; 100% wool). Knitable in 7 sizes to fit bust from 31″ (79 cm) to 49″ (125cm). Do you see why I love this design? 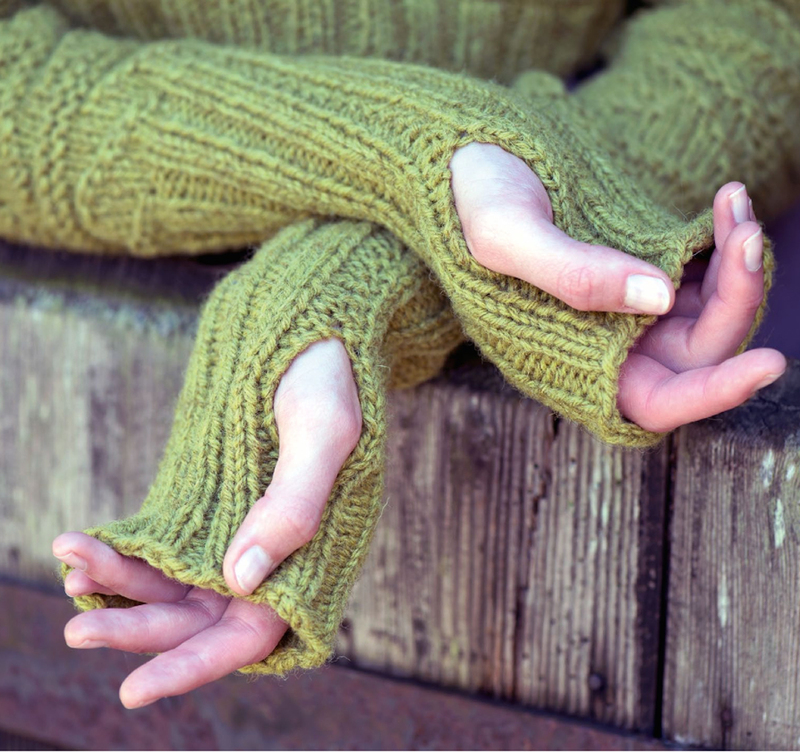 Elizabeth Lovick added fingerless mitts to the sleeves! They can be folded back for not so cold days and disappear! 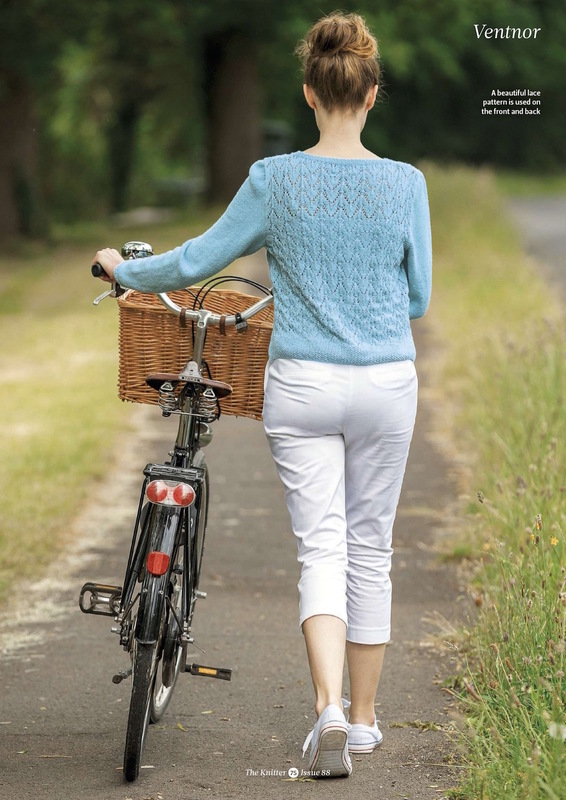 This pattern is originally published in Rowan’s Simple Shapes Fine Art Aran, a brochure showing 8 designs by Sarah Hatton using Rowan Yarns Fine Art Aran ( Aran weight; 50% wool, 25% alpaca, 20% mohair, 5% silk). This “big brother” of the Fine Art is available in 6 hand-painted shades. Read more about the Fine Art Story here. Or you may join LifeLackaDaisiCal on her blog. You may also be inspired by Dayana, doing intended pooling with this yarn. The body of this cardigan is knitted in the round, starting at the centre. The shawl-collar developes by itself. Stitches are cast off to form the armholes to which the sleeves, which are worked in the round are joined later. Keep calm and be a princess. Isn’t this cute? 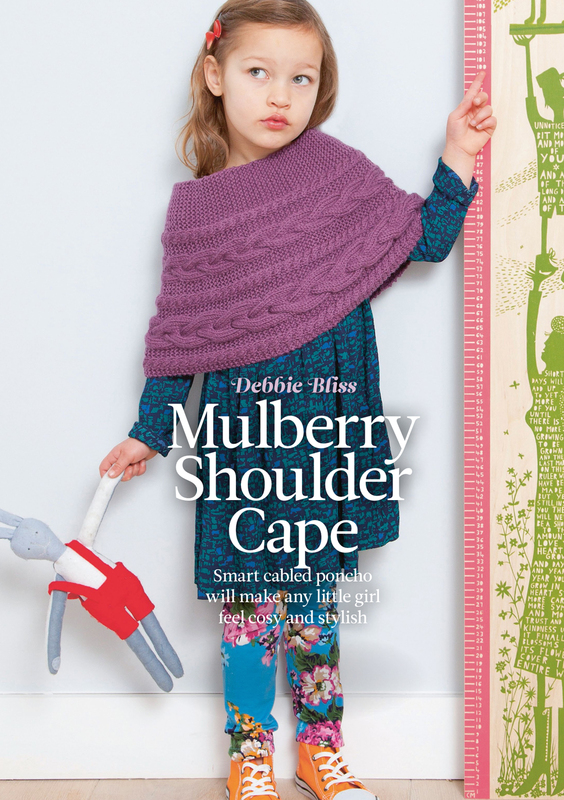 Knit this Shoulder Cape for your little princess using Debbie Bliss’ Cashmerino Aran (Aran weight; 55% extra fine merino wool, 33% acrylic, 12% cashmere) yarn. The cape is showing different cables decided by garter stitch panels. Knitable in 3 sizes to fit a princesses from age 2 – 7. 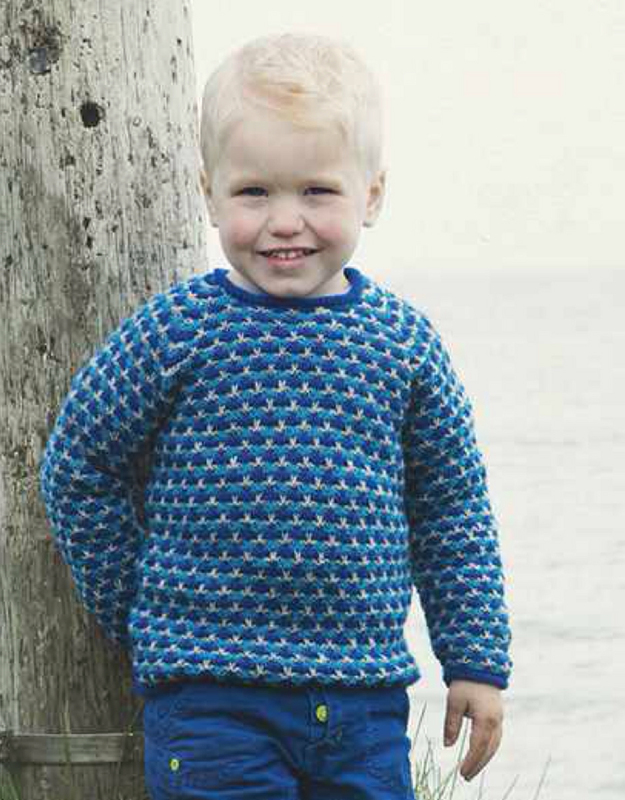 This design is originally published in ‘Cashmerino Aran‘ by Debbie Bliss, a new book featuring 11 children’s designs. 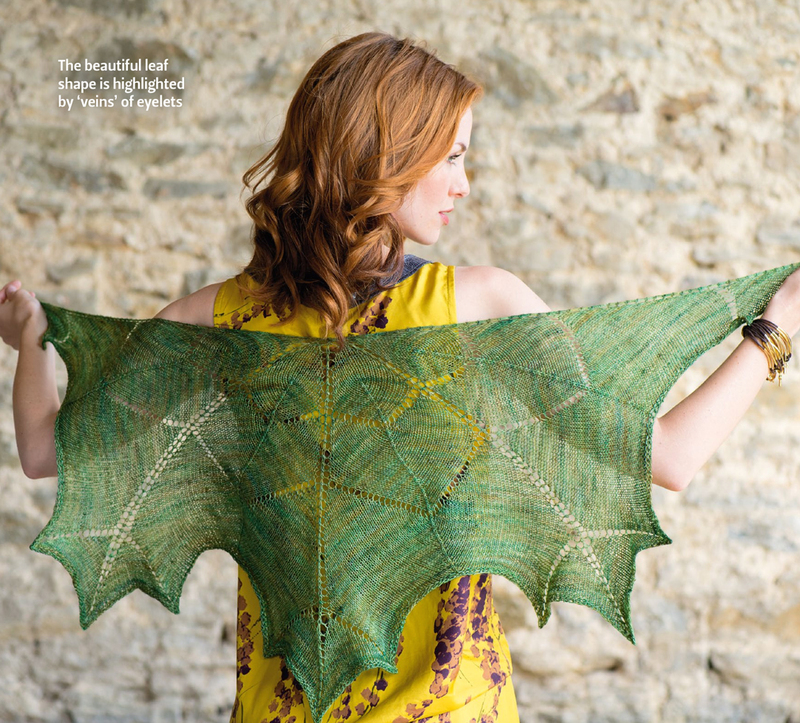 The mini collection of this issue is featuring the Maple Leaf Shawl of Maria Magnusson. A one-skein project shown here in Madelintosh Prairie (Laceweight; 100% merino wool). This shawl is started with 2 stitches and worked outwards to form the maple leaf shaped edge. Isn’t it stunning? The next issue of The Knitter will be on sale October 14. It will feature exclusive designs from Sasha Kagan, Lisa Richardson, Marina Orry, Martin Storey, Arne & Carlos … and more. And it will include a free socks booklet, too.